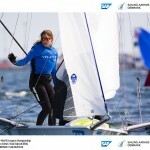 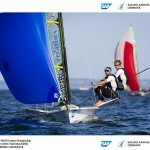 Day 2, the final day of qualifying was a great day of sailing for the 49er fleet. 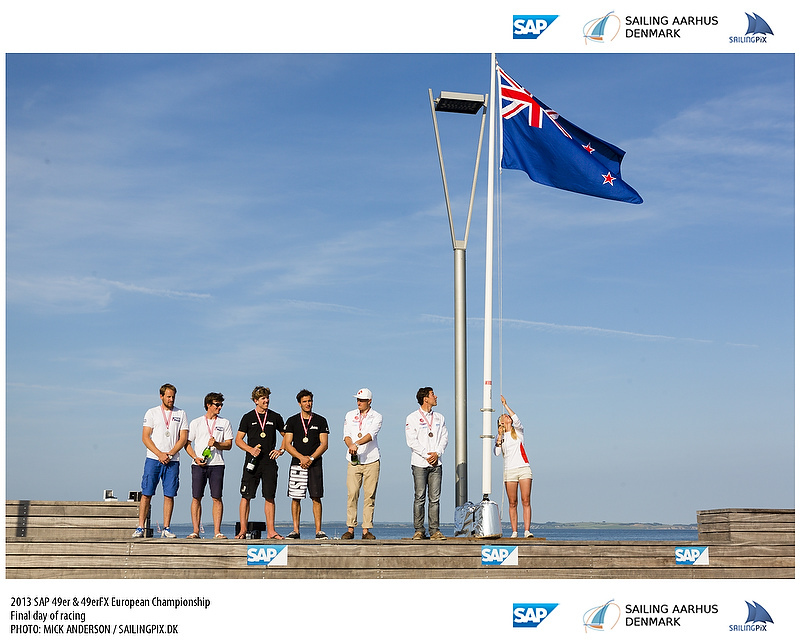 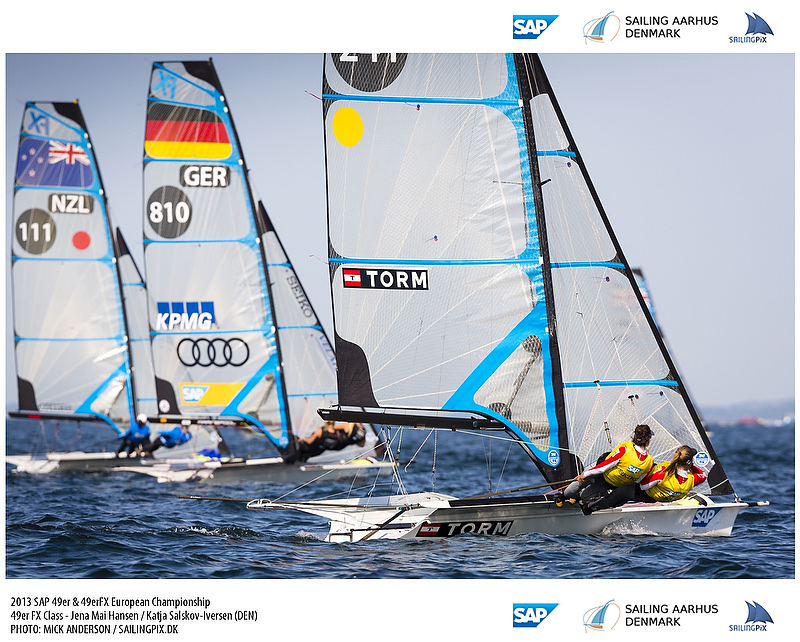 Despite the tricky conditions yesterday that saw many top teams pick up a deep race, most of them sailed well enough to day to qualify for the gold fleet. 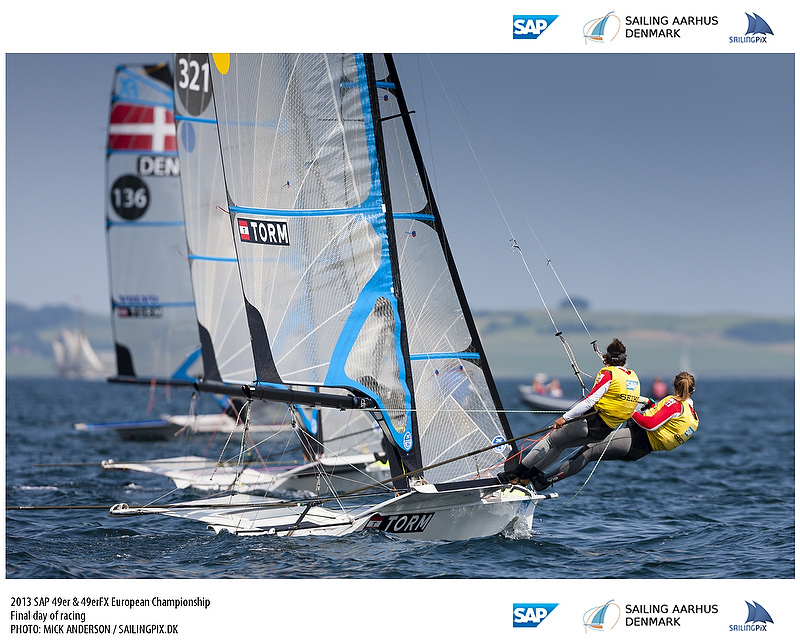 All 3 qualifying fleets were on the water at the same time today to ensure as much fairness as possible, and they were able to enjoy some excellent racing. 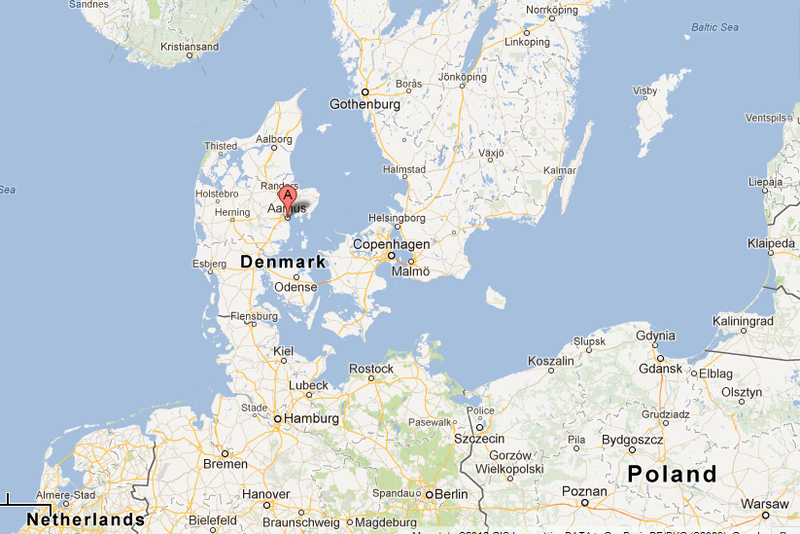 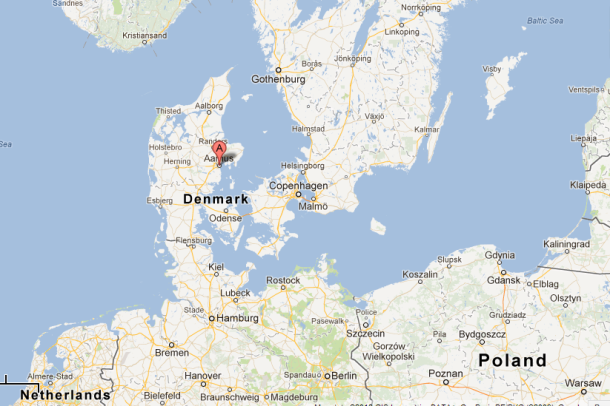 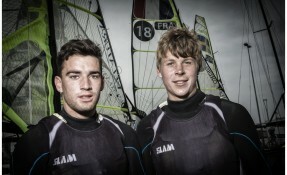 On excellent form today was Marcus Hansen and Josh Porbeski from New Zealand. 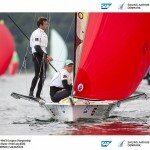 They scored a 22nd in yesterday meaning that they had very little room for error today. 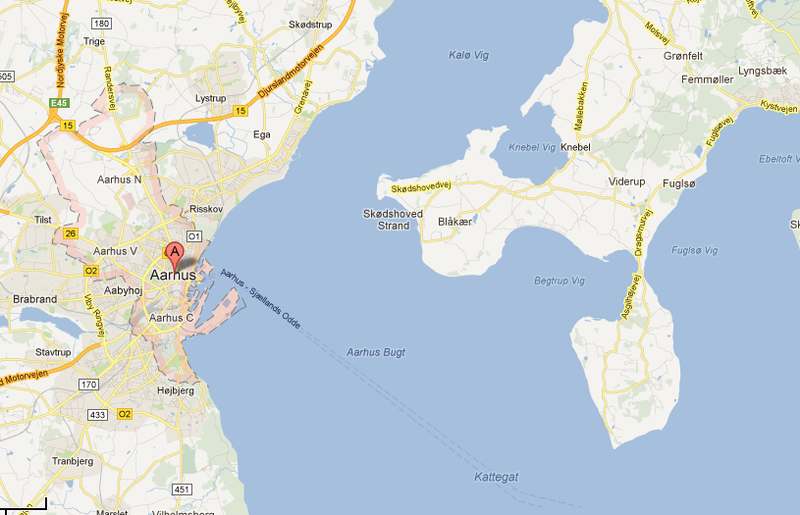 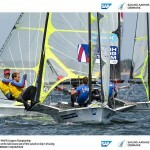 There were no errors, as they “sailed fast to the left” which was rewarded with a 2, 1, 1, 2 scoreline. 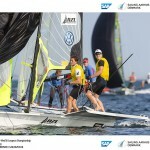 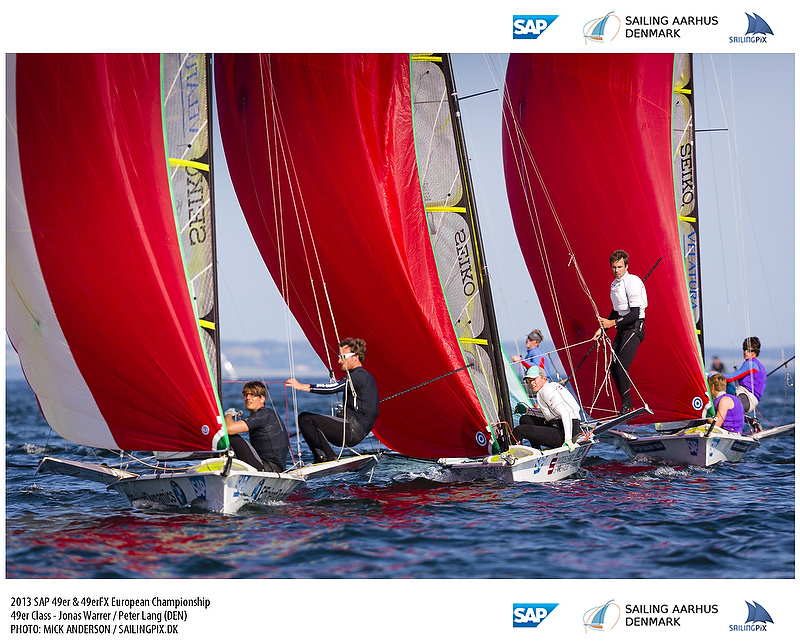 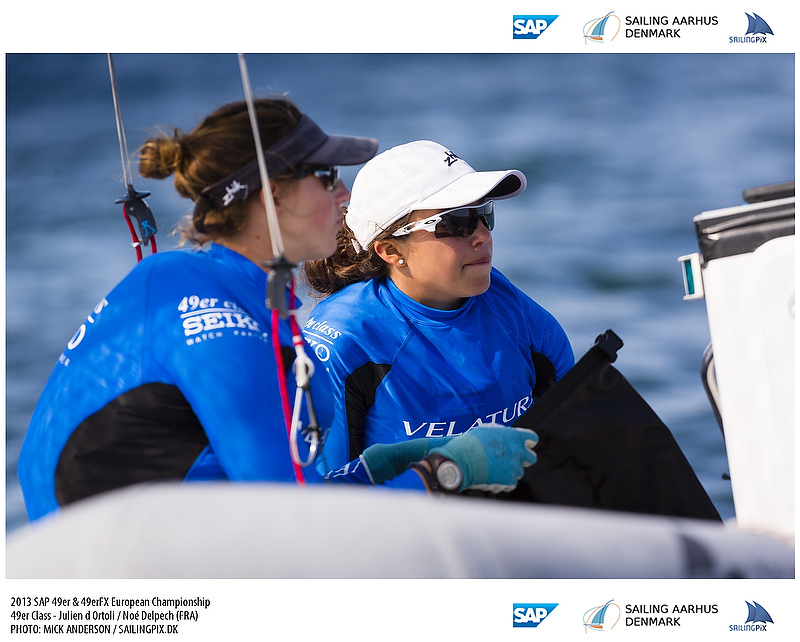 They now have a 6 point lead on the fleet which they’ll take forward in to the Gold fleet racing. 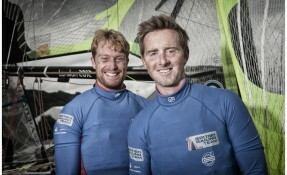 Also in top form were some of the usual suspects. 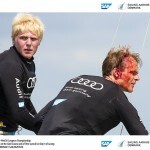 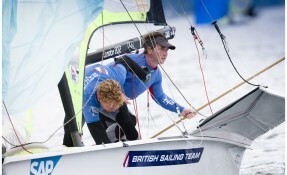 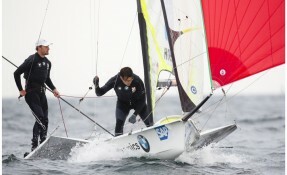 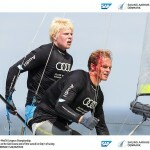 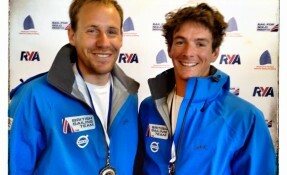 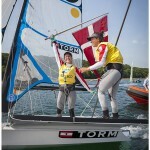 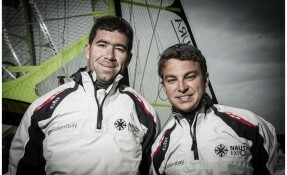 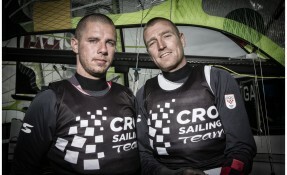 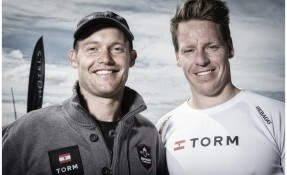 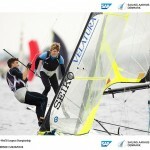 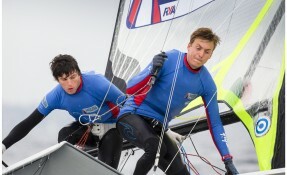 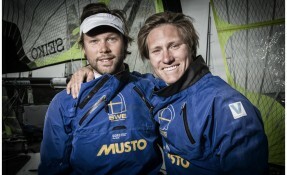 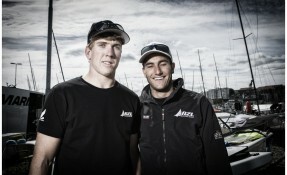 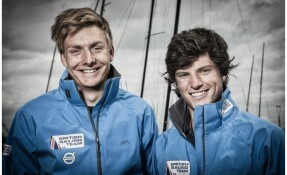 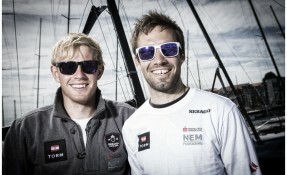 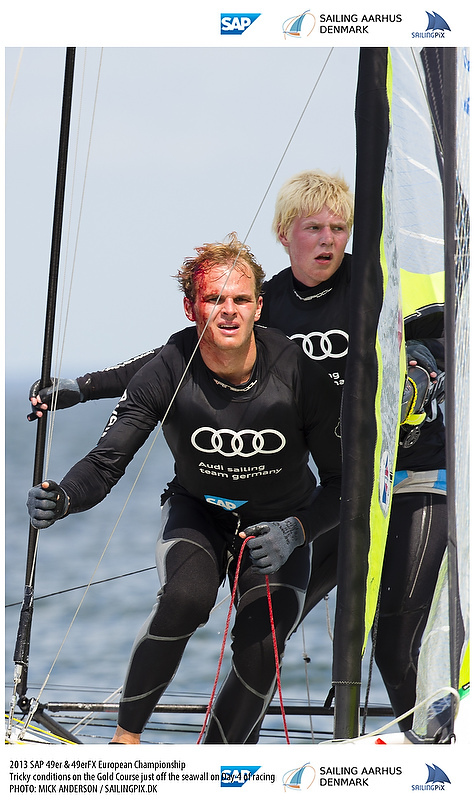 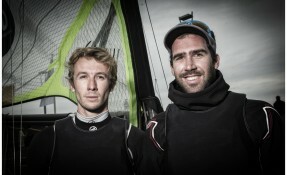 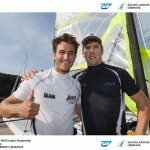 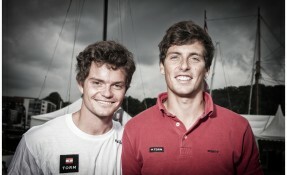 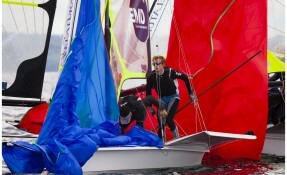 Dylan Fletcher and Alain Sign of the British Sailing team enjoyed today’s conditions. 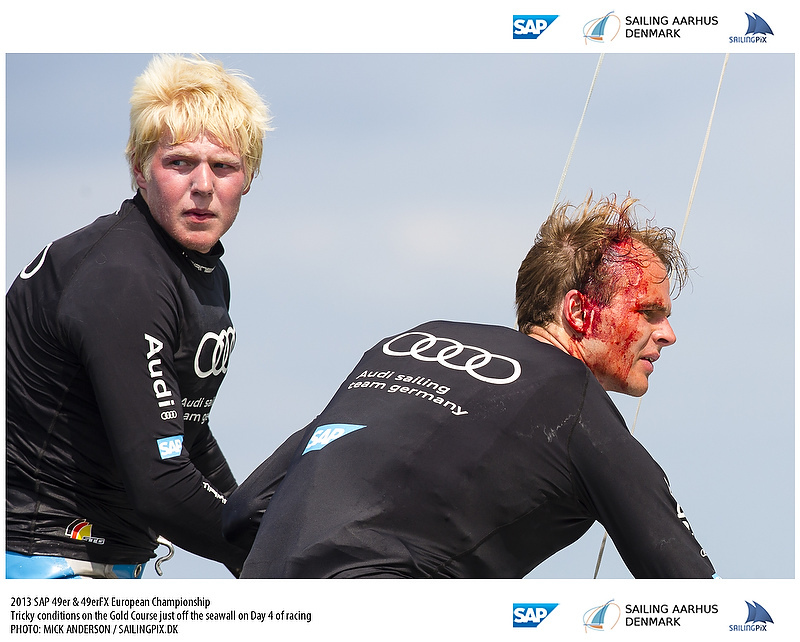 The modest breeze, big waves and strong competition made for a fun day for those who were able to thrive. 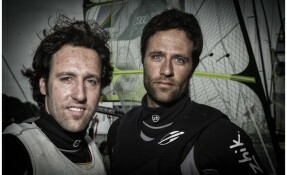 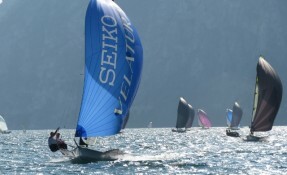 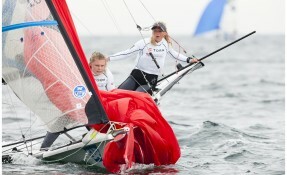 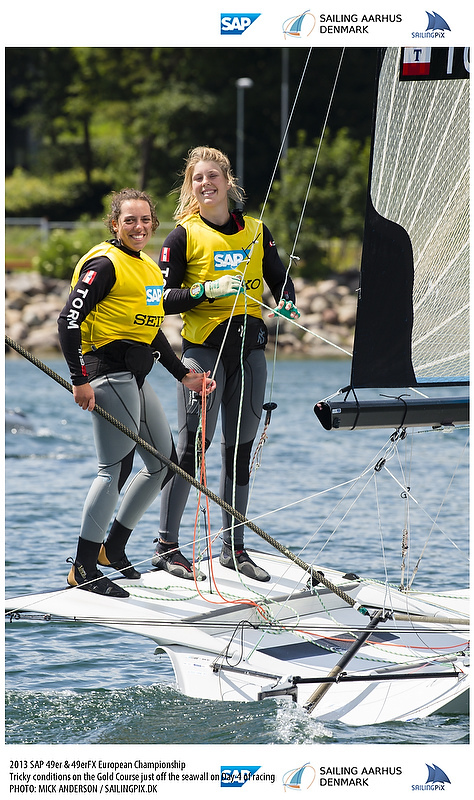 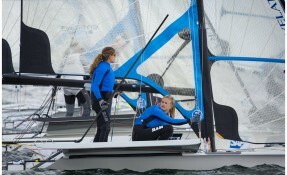 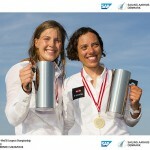 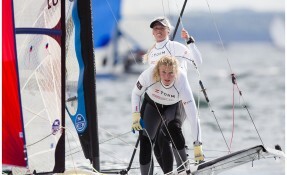 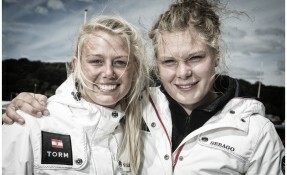 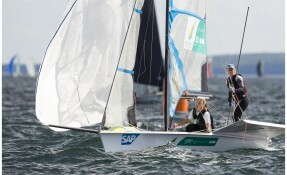 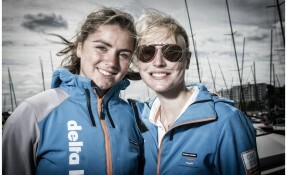 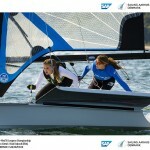 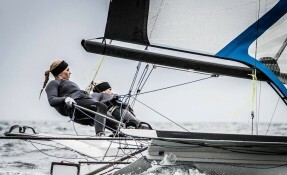 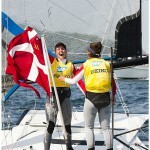 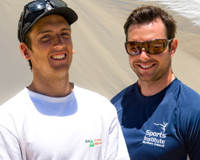 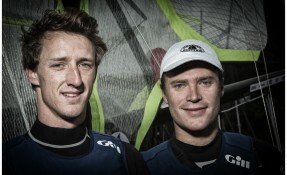 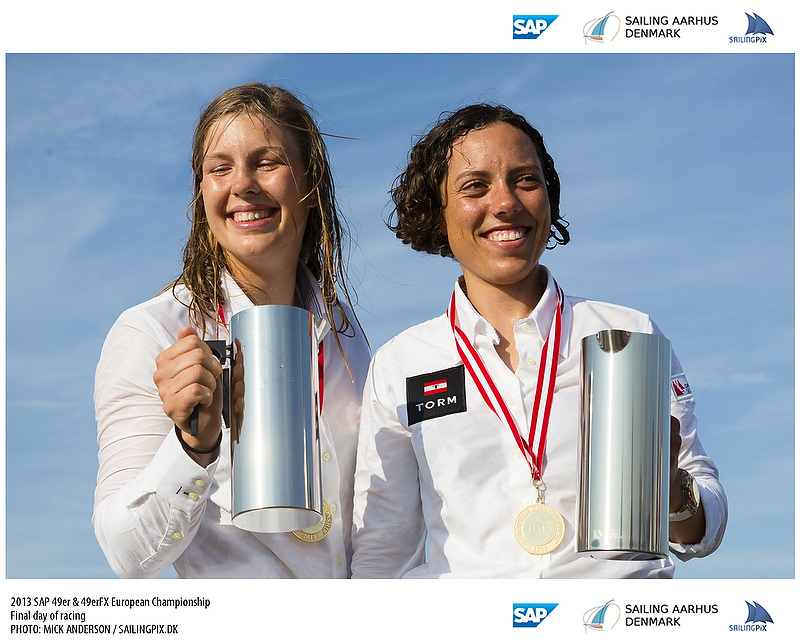 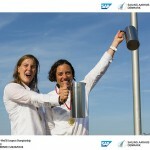 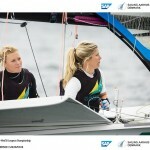 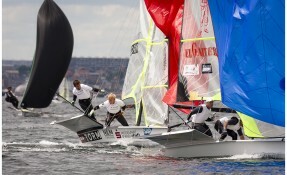 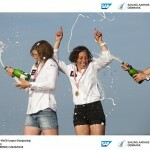 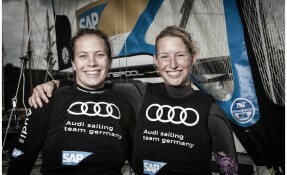 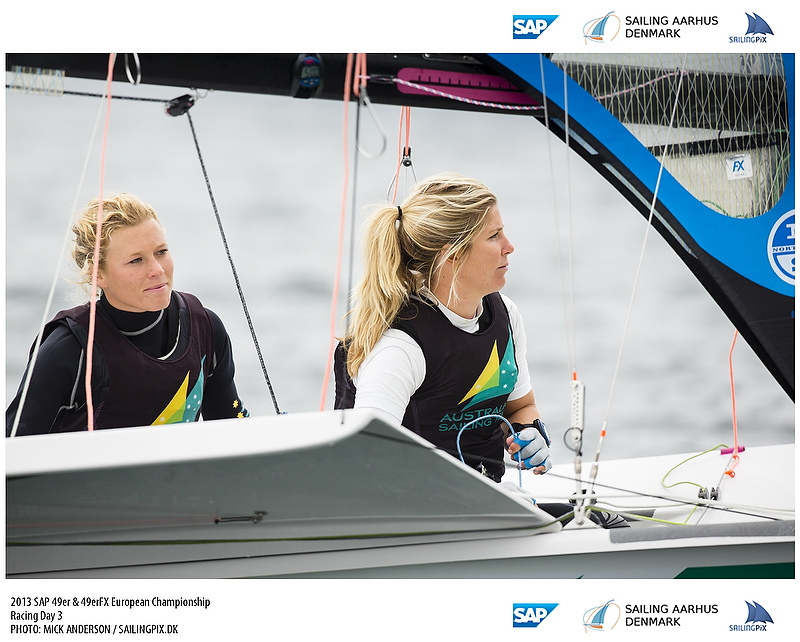 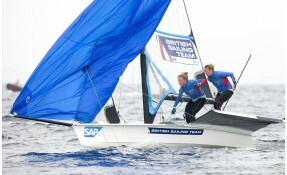 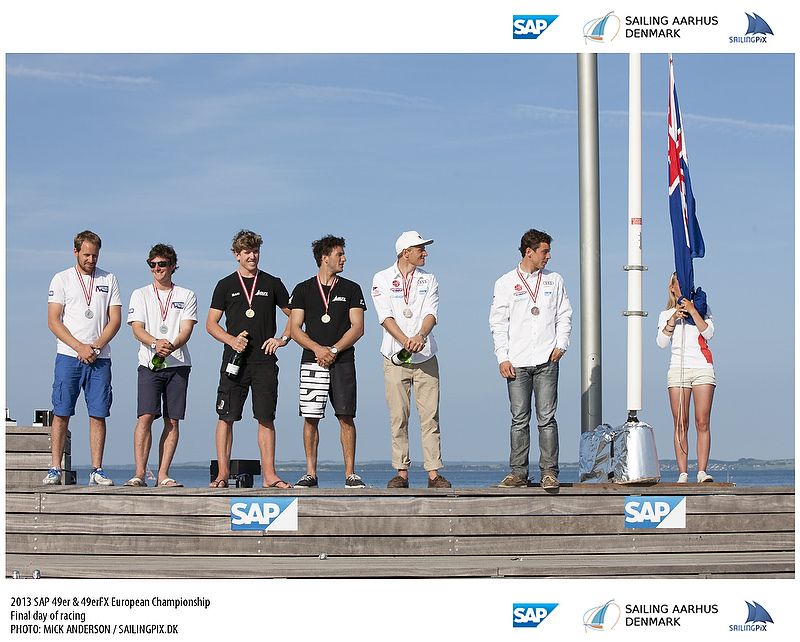 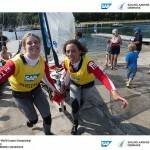 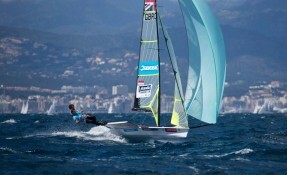 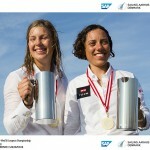 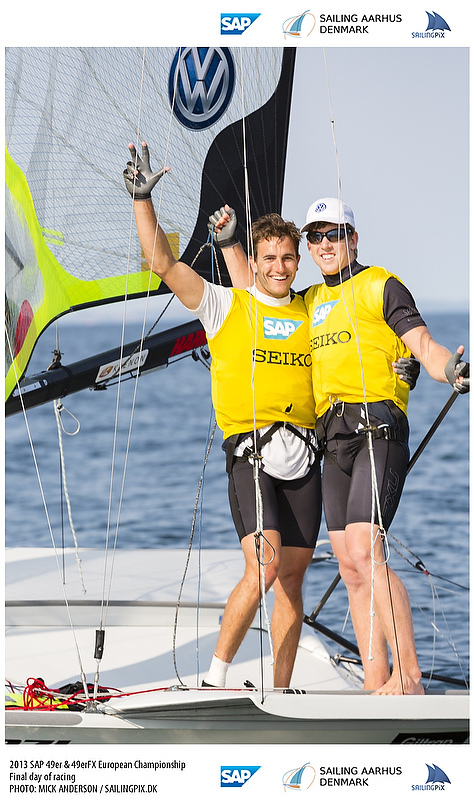 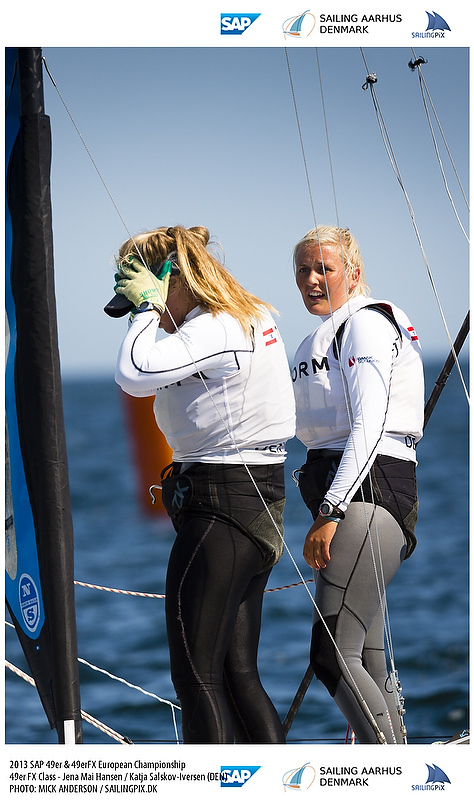 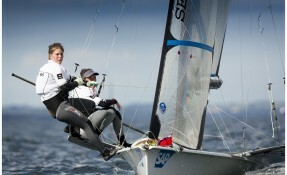 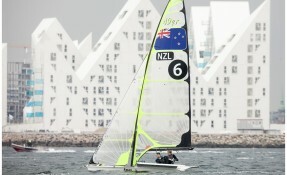 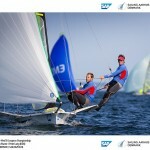 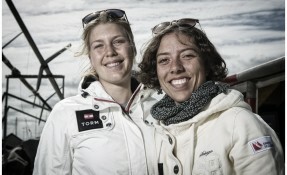 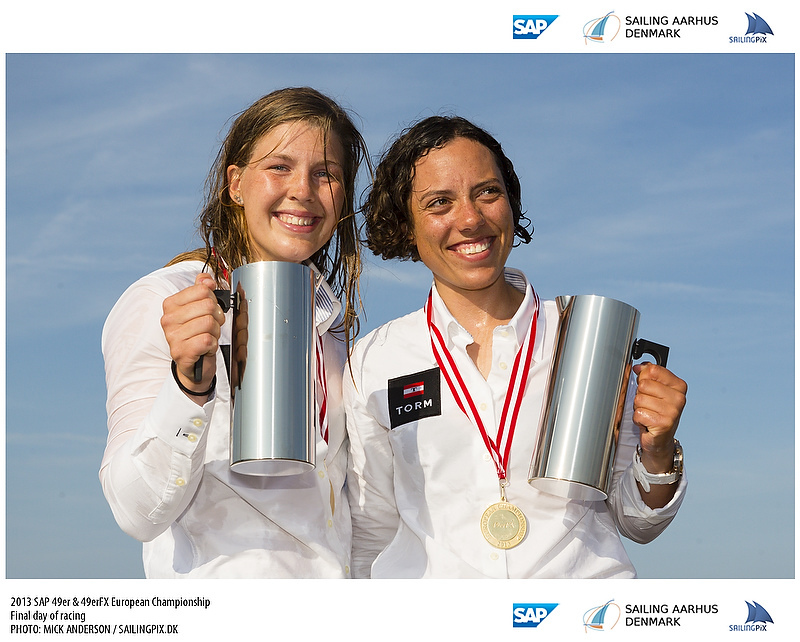 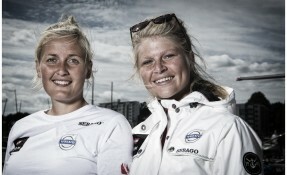 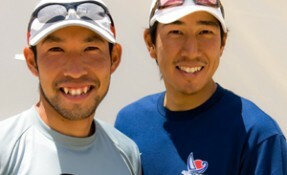 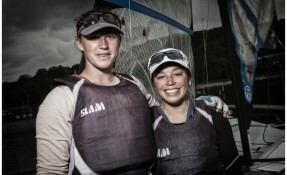 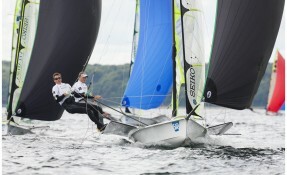 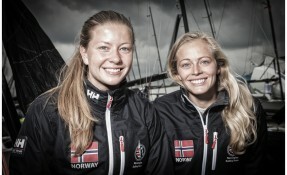 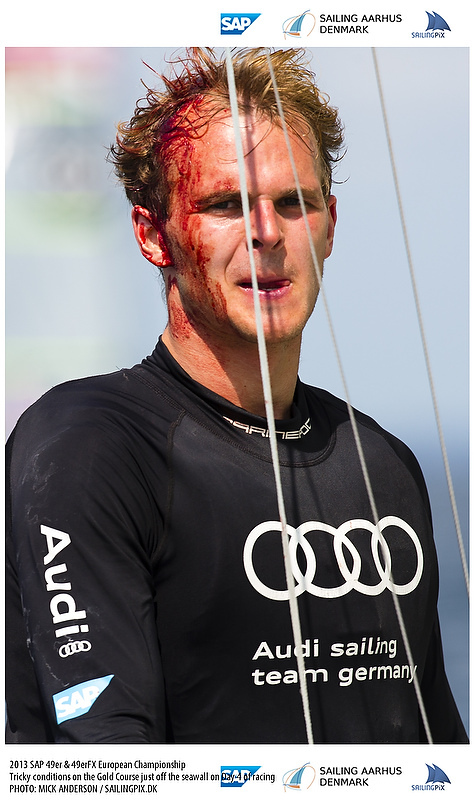 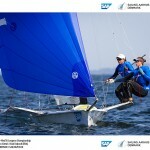 Fletcher/Sign missed the 2012 Europeans so they are looking to get back on the podium like they were in 2011. 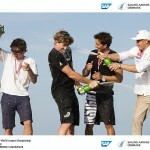 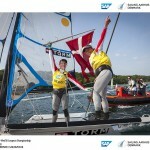 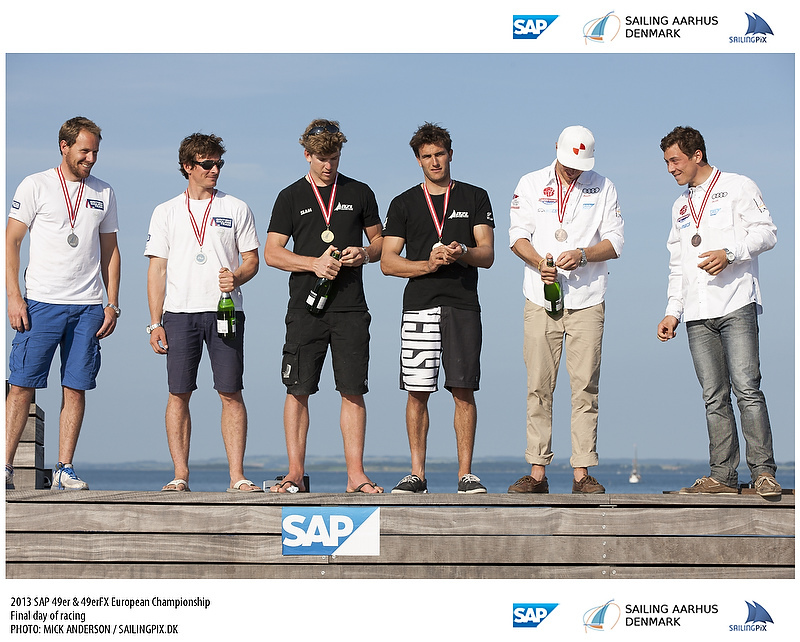 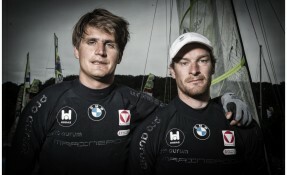 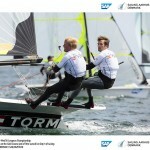 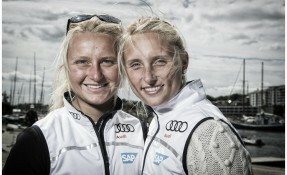 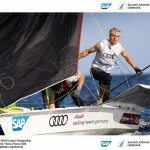 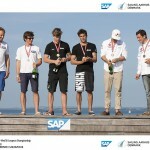 In 6th overall after qualifying are the recent Keiler Woche winners, Nico Delle Karth and Nikolaus Resch from Austria. 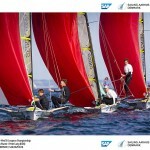 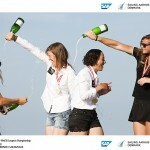 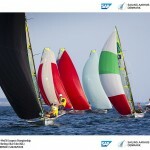 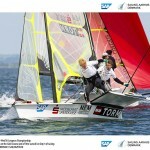 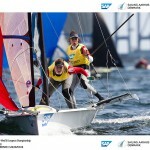 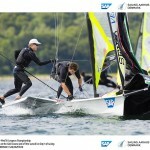 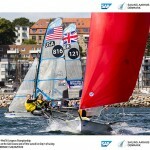 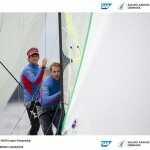 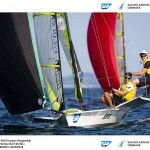 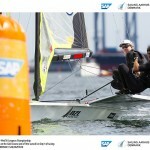 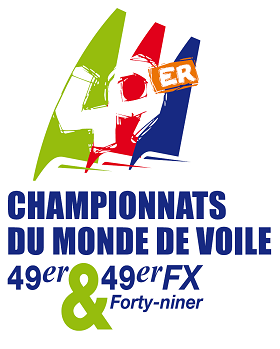 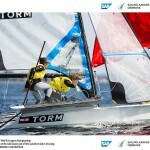 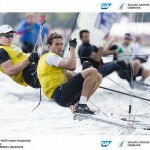 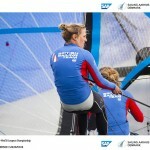 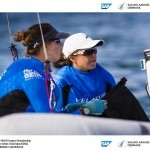 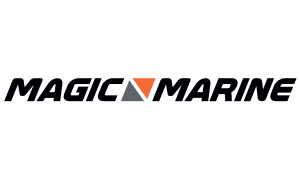 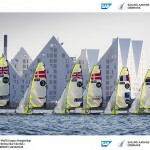 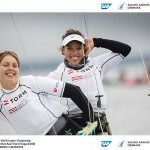 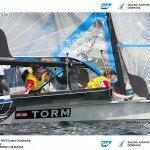 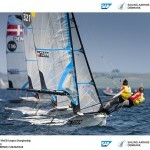 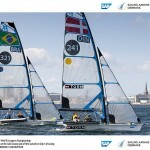 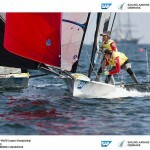 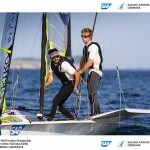 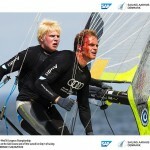 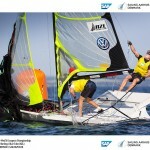 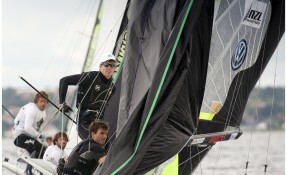 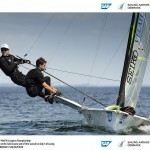 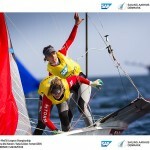 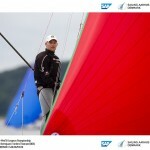 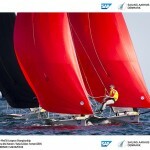 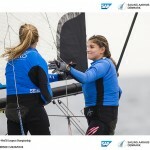 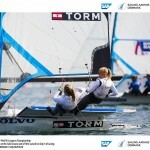 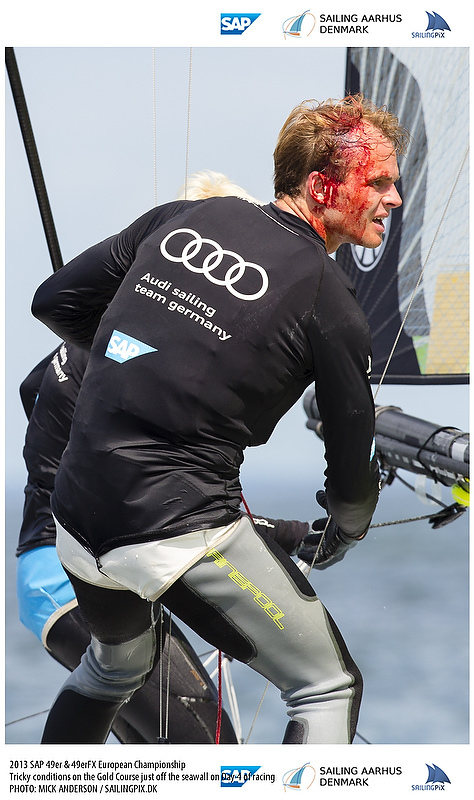 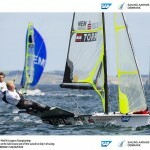 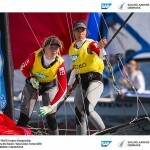 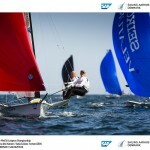 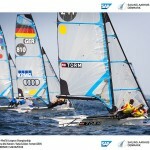 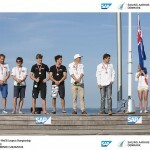 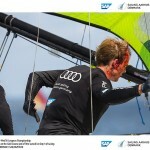 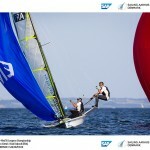 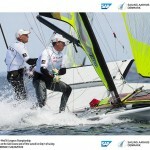 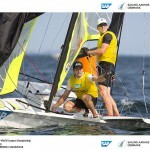 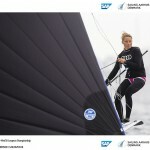 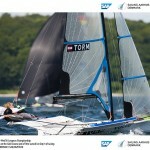 They commented on how well the gate windward mark seems to be working, a new detail of 49er racing recently. 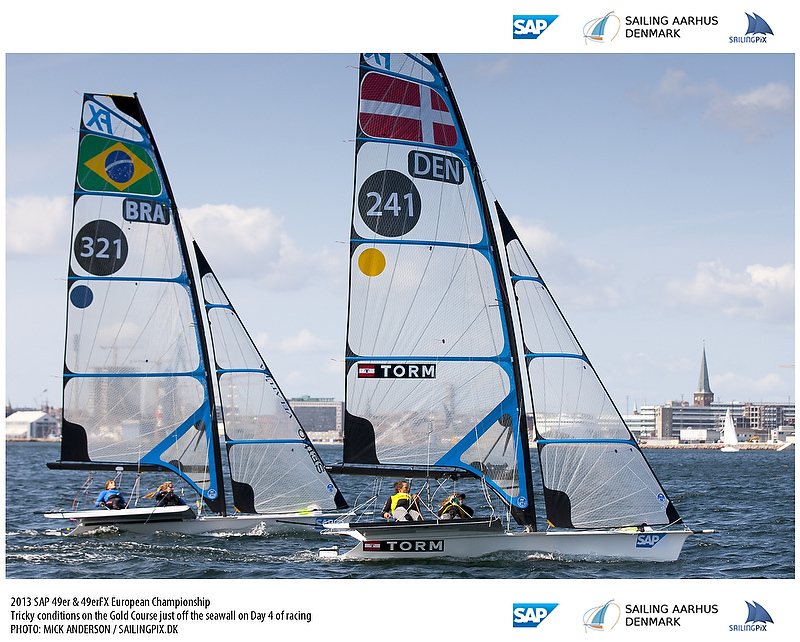 The gate windward marks are meant to reduce the bottleneck and procession that is typical in larger fleets which keeps the racing closer. 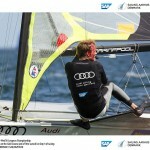 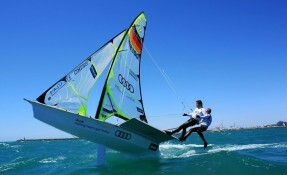 While it is still a fairly new concept to Olympic racing, Niko said that it has been working really well so far. 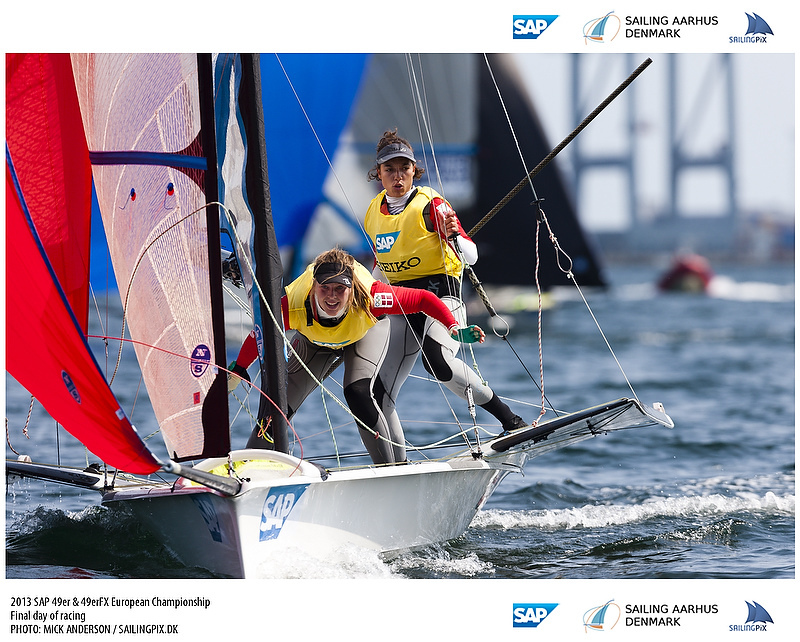 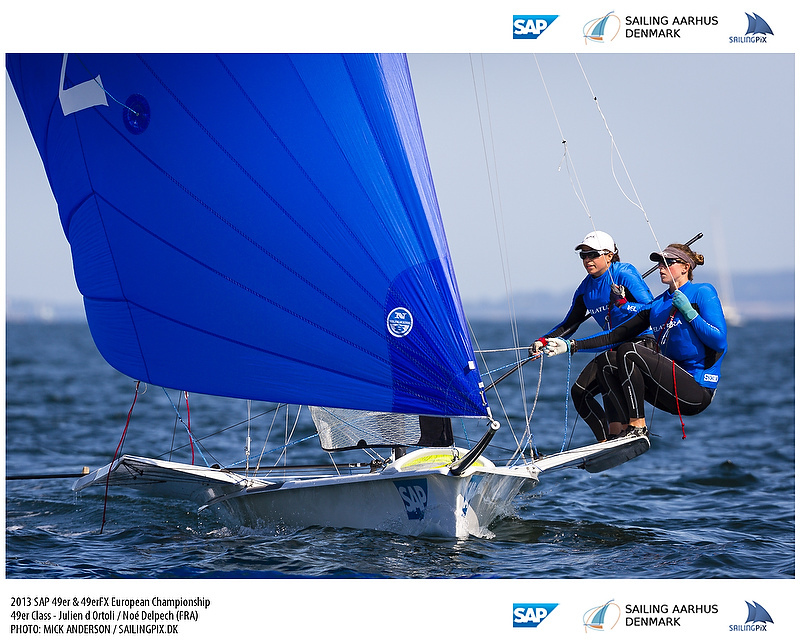 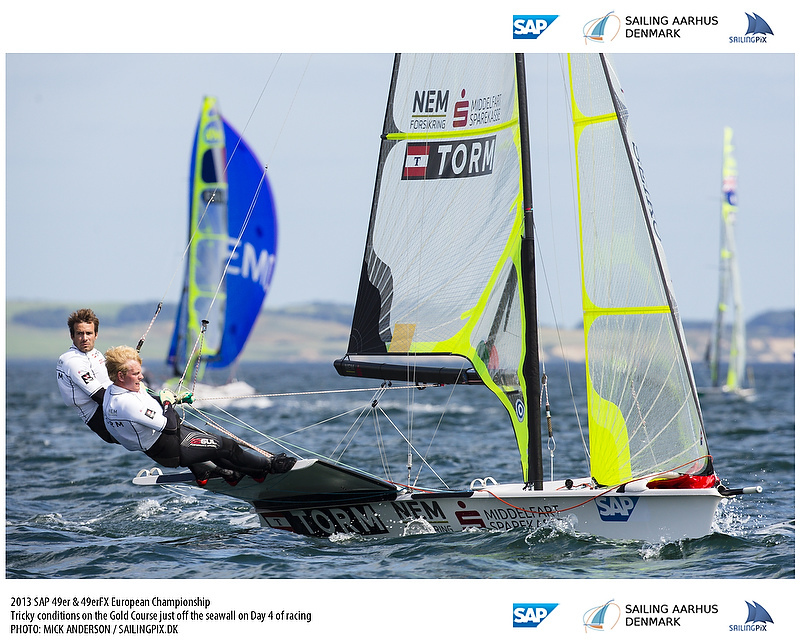 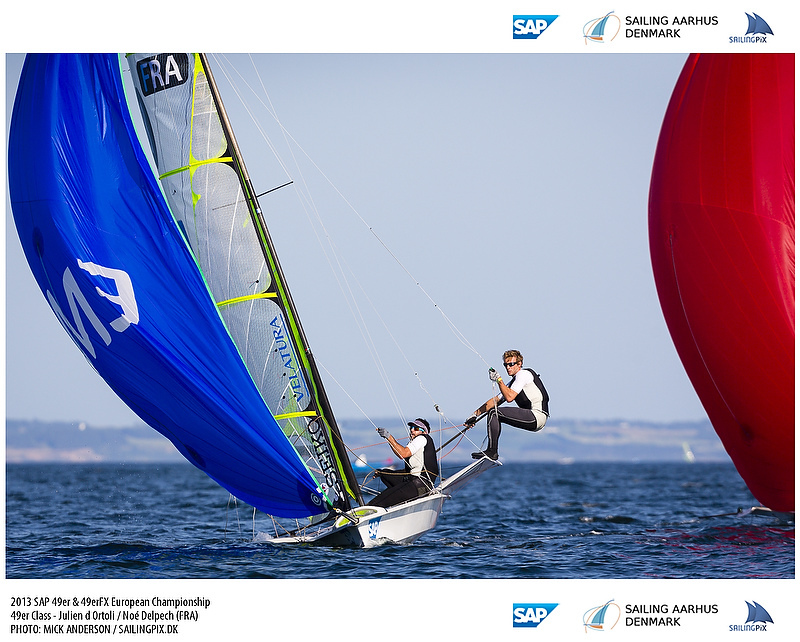 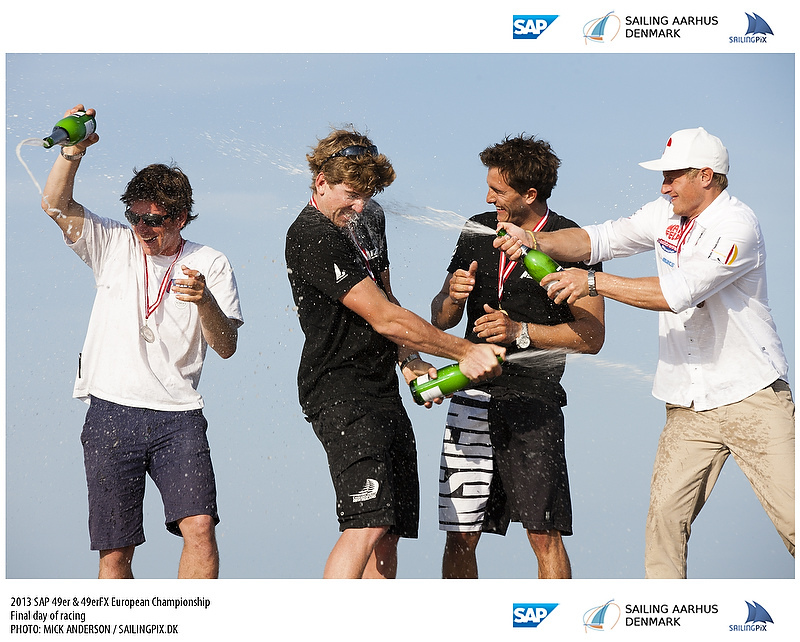 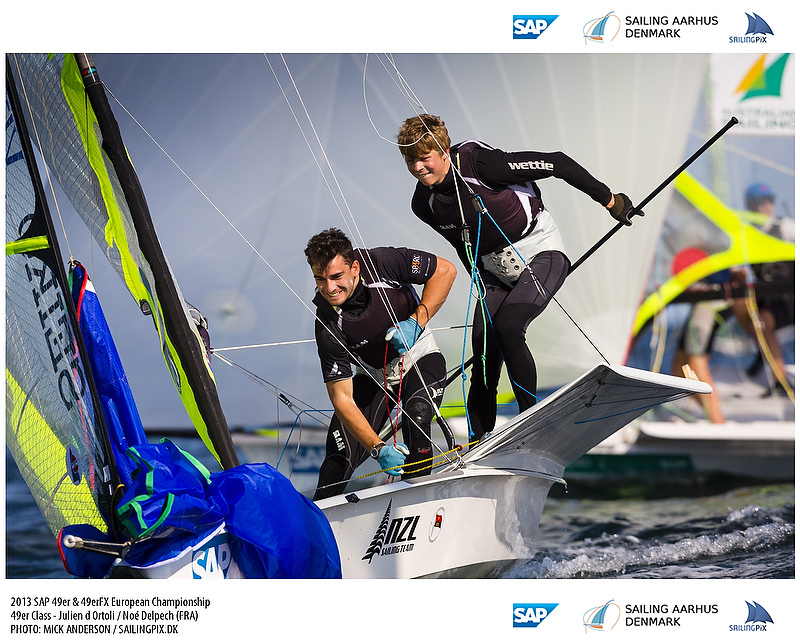 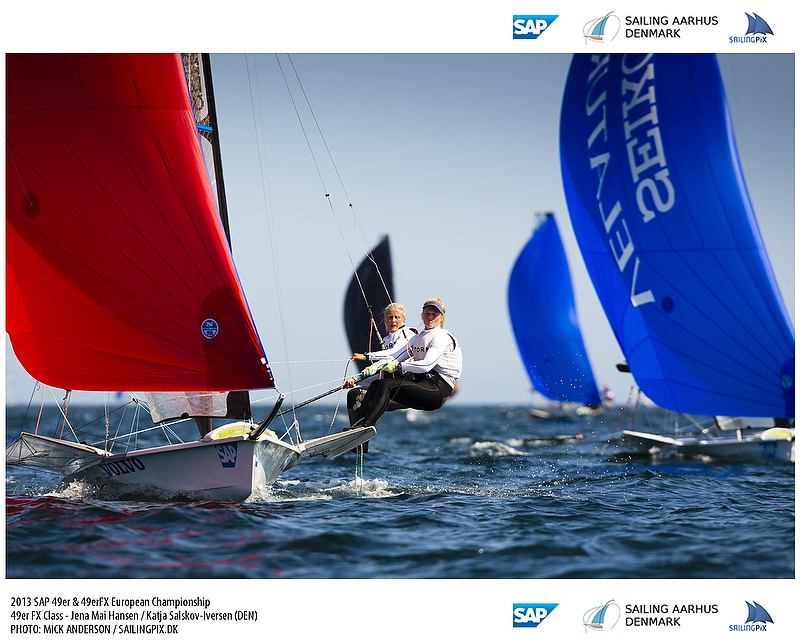 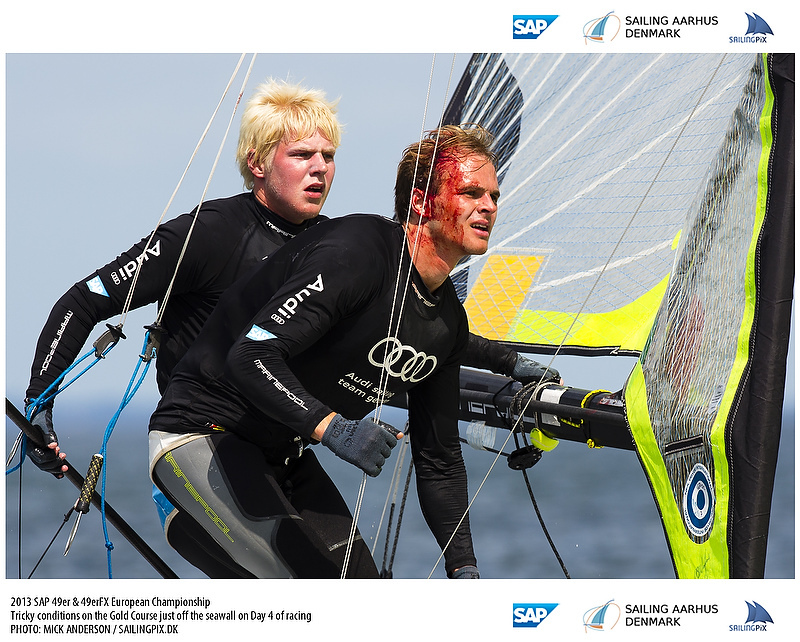 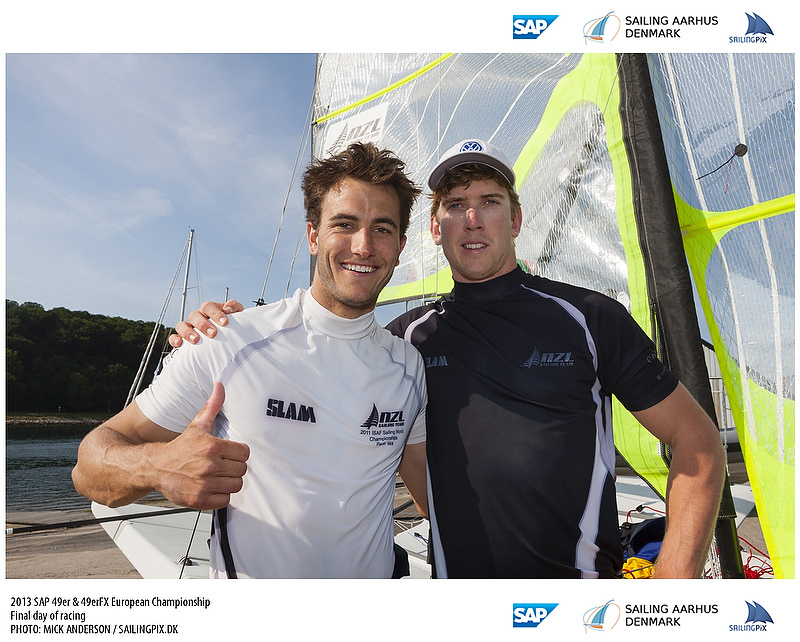 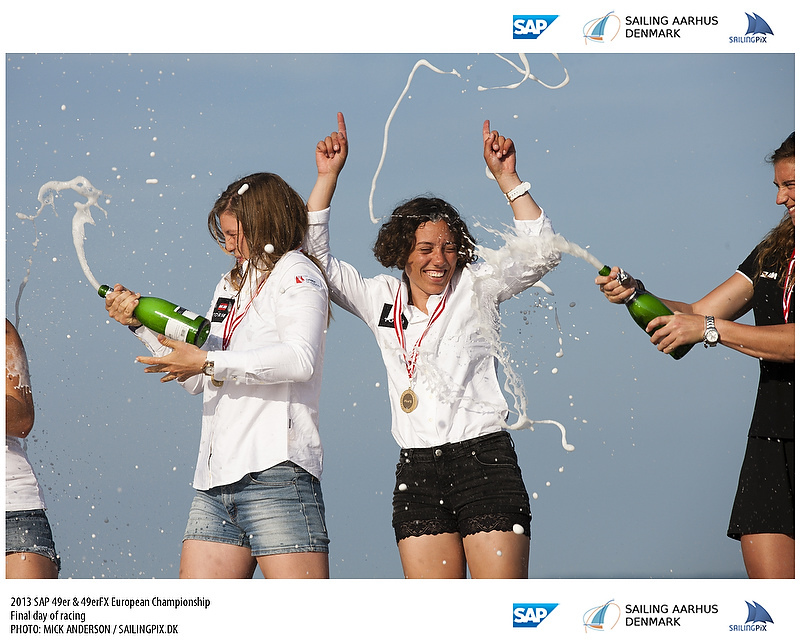 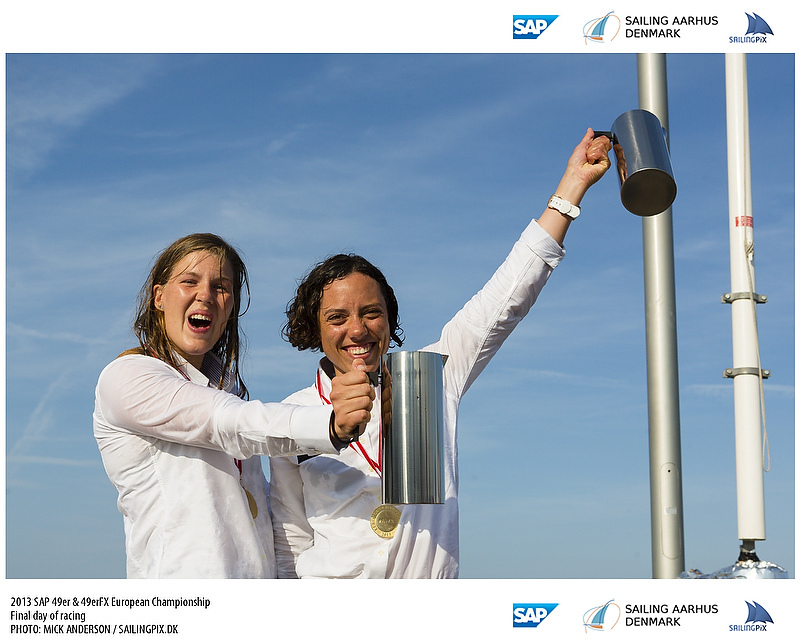 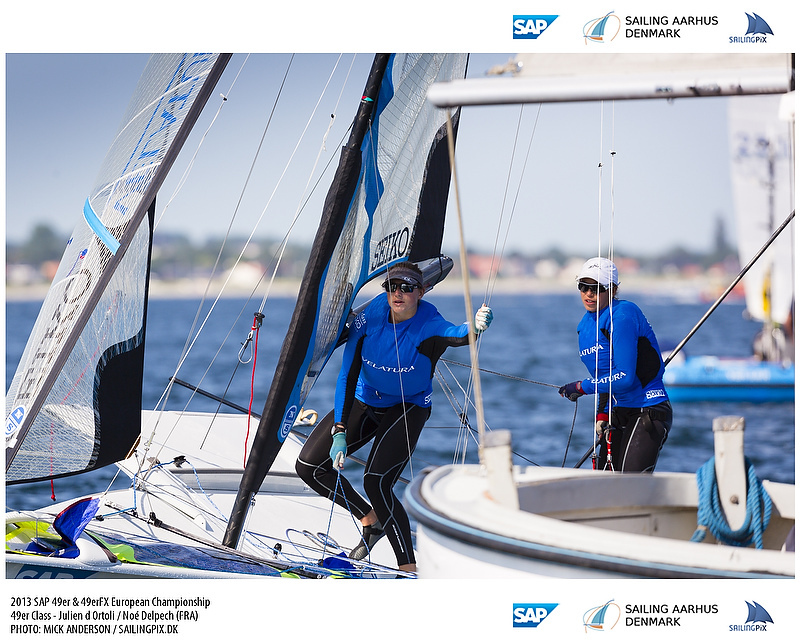 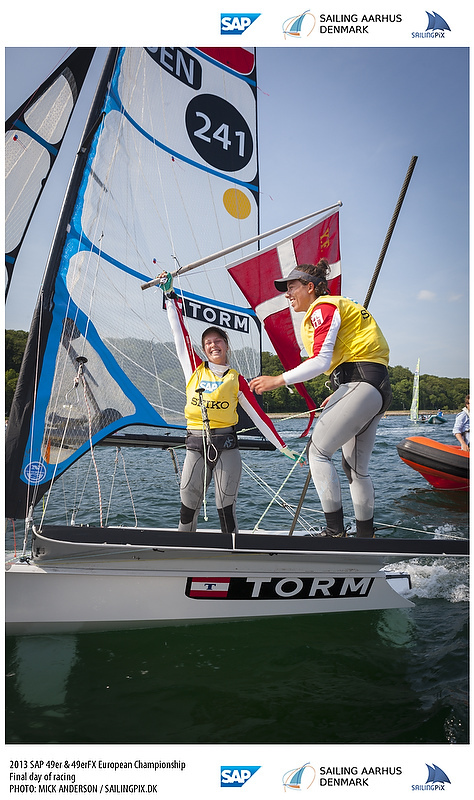 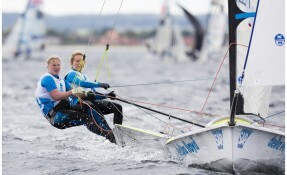 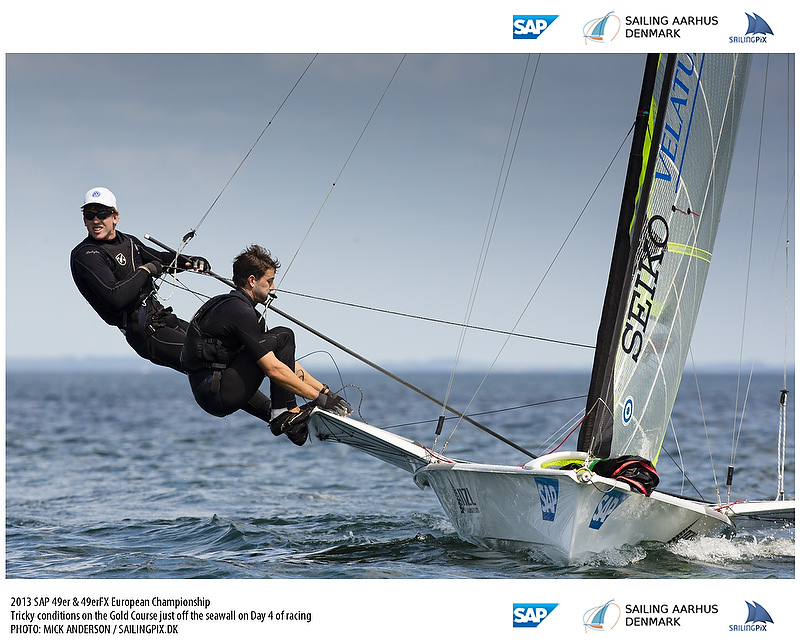 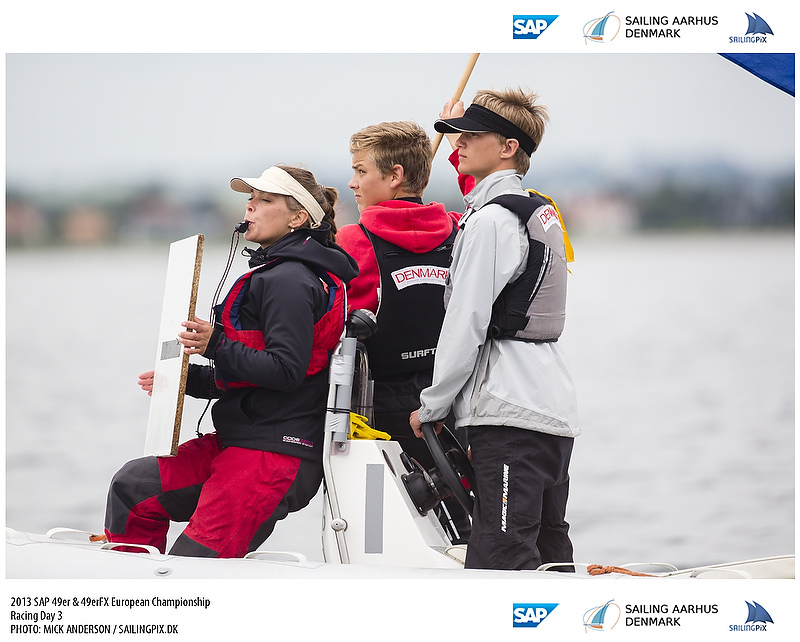 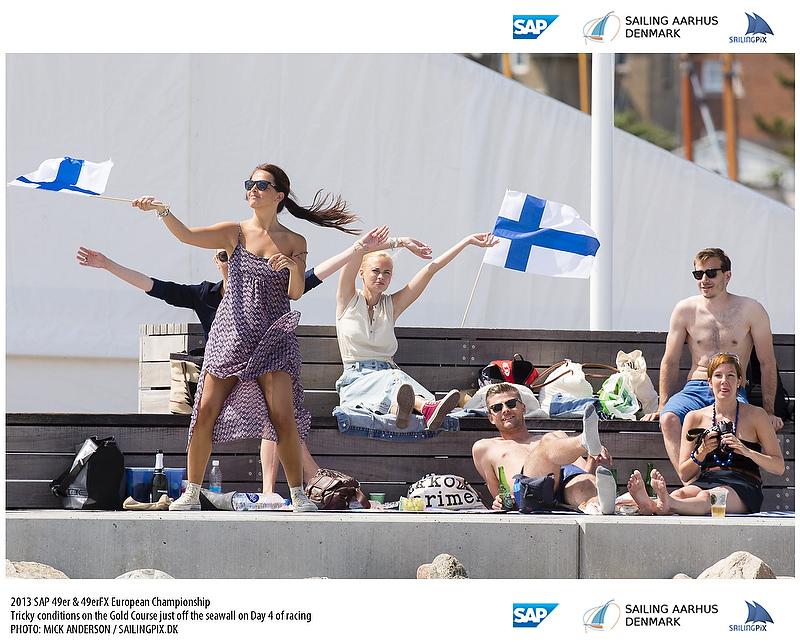 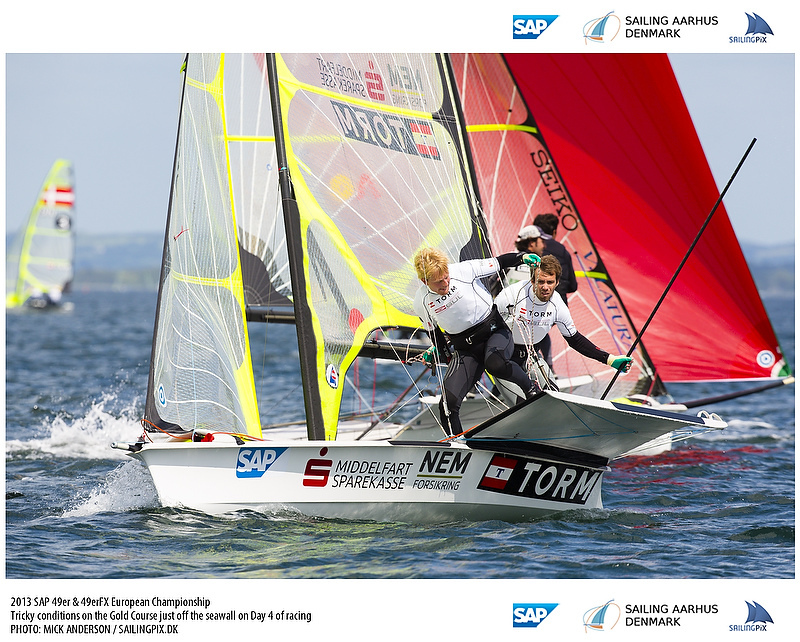 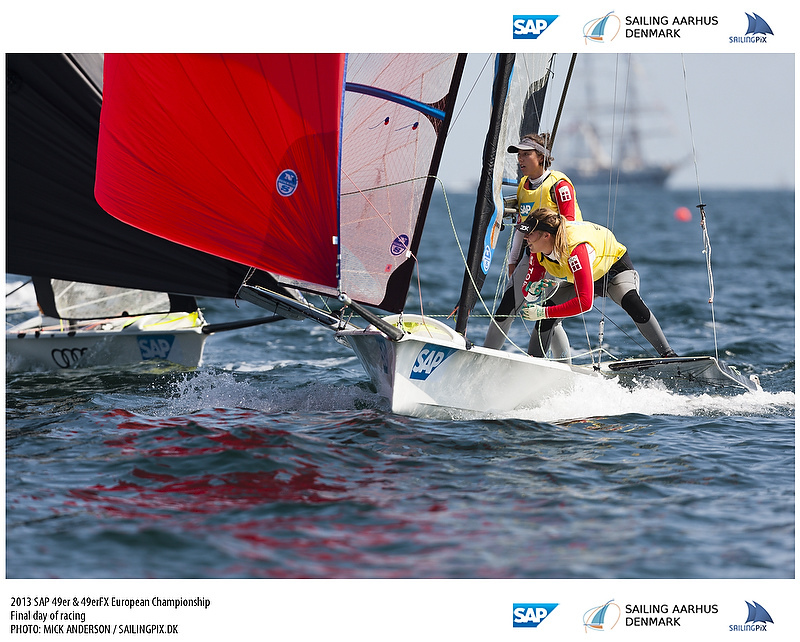 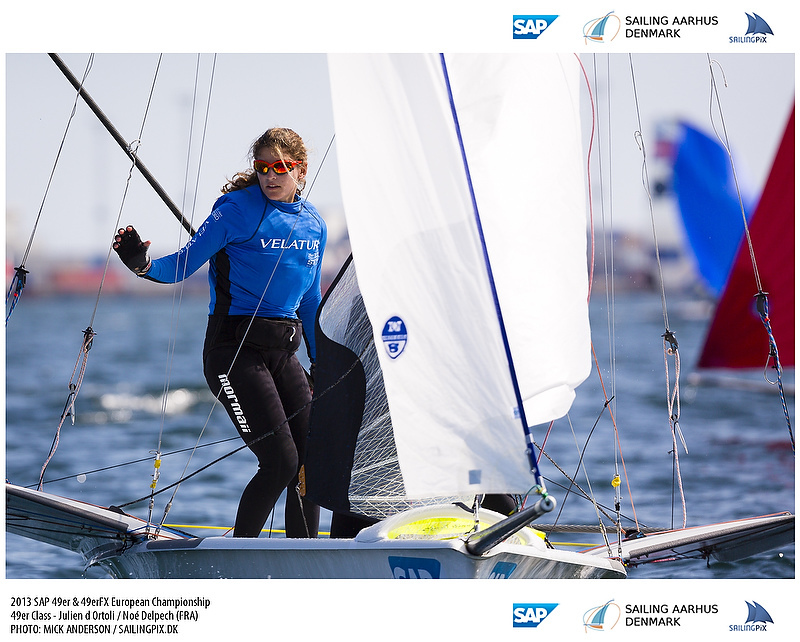 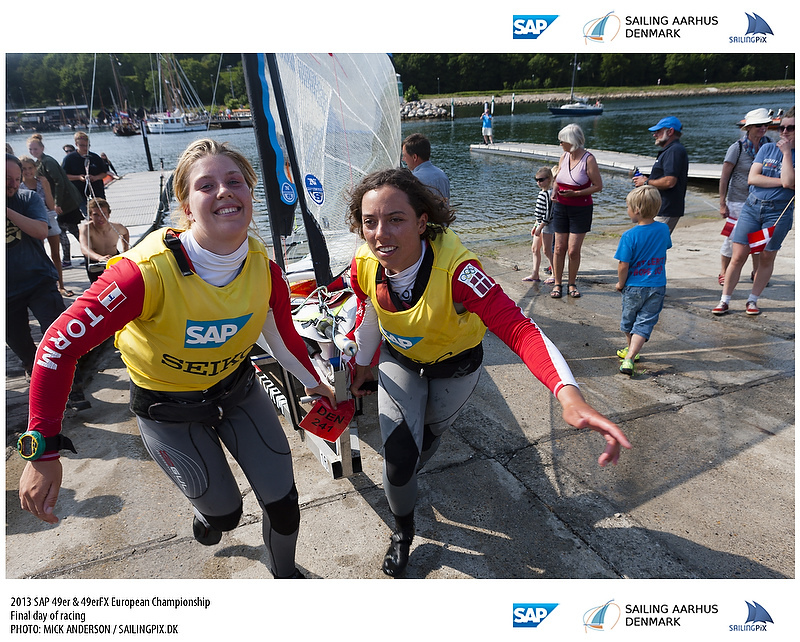 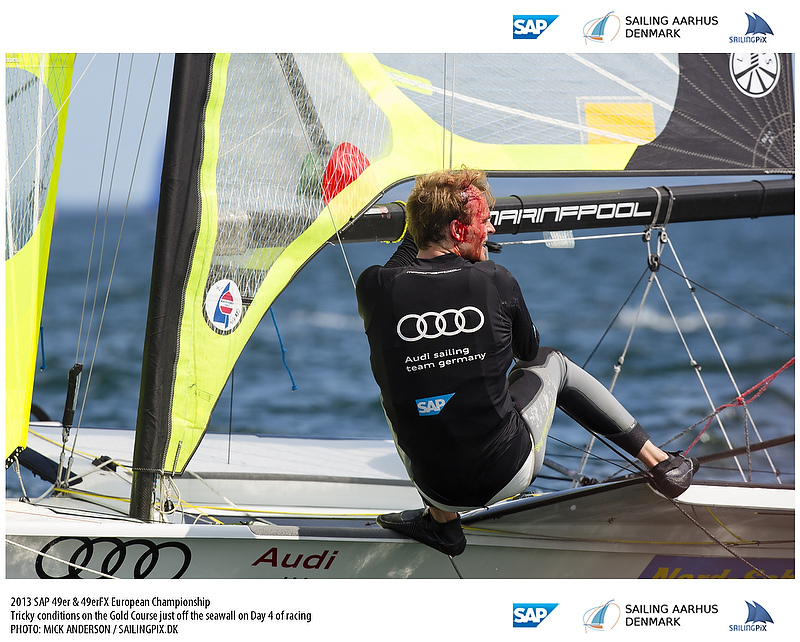 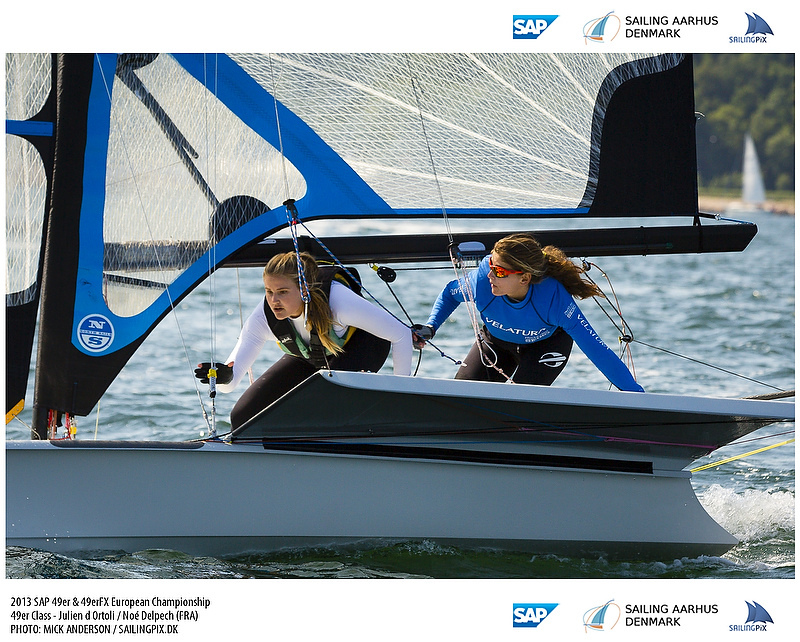 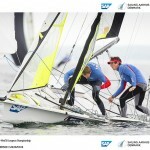 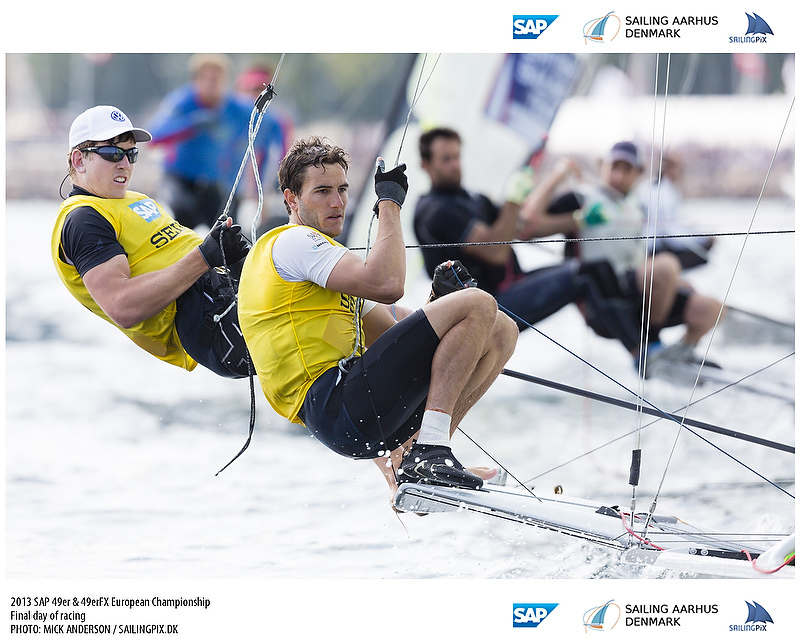 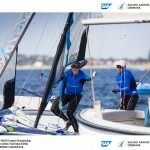 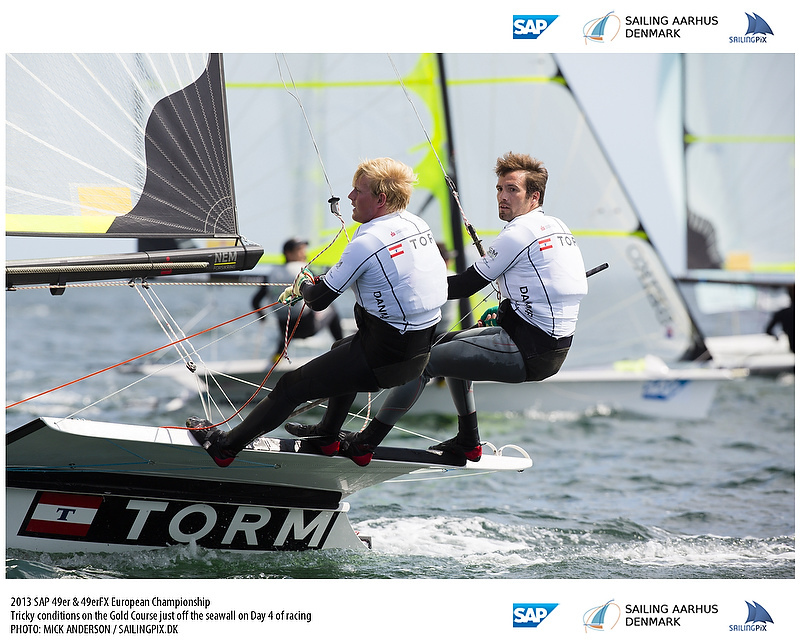 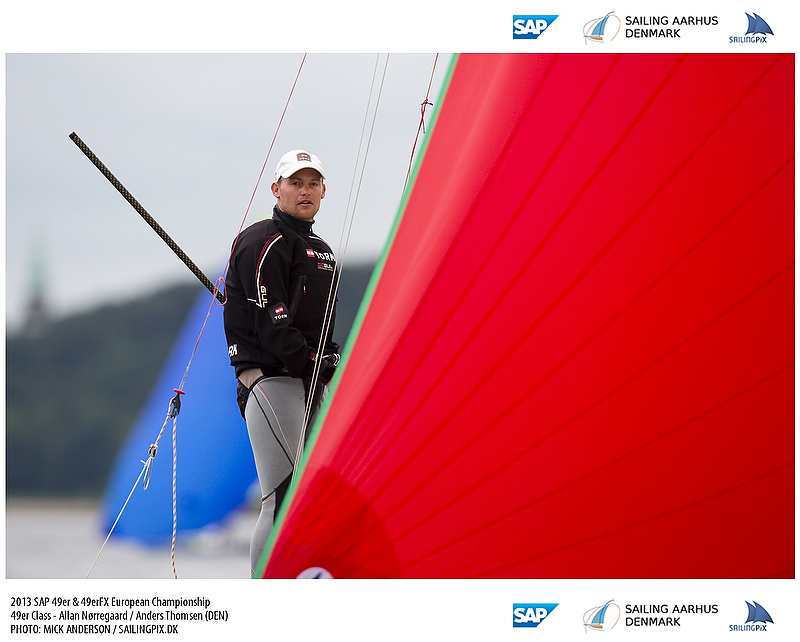 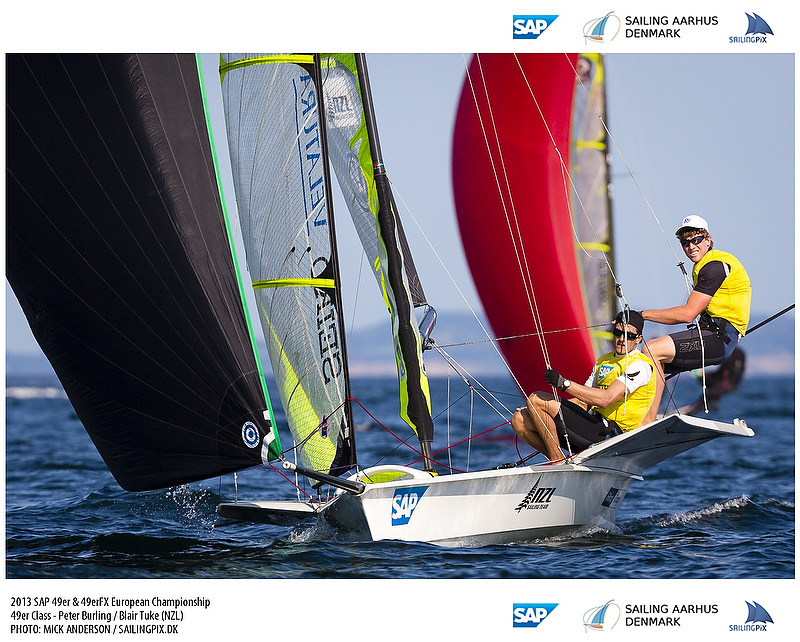 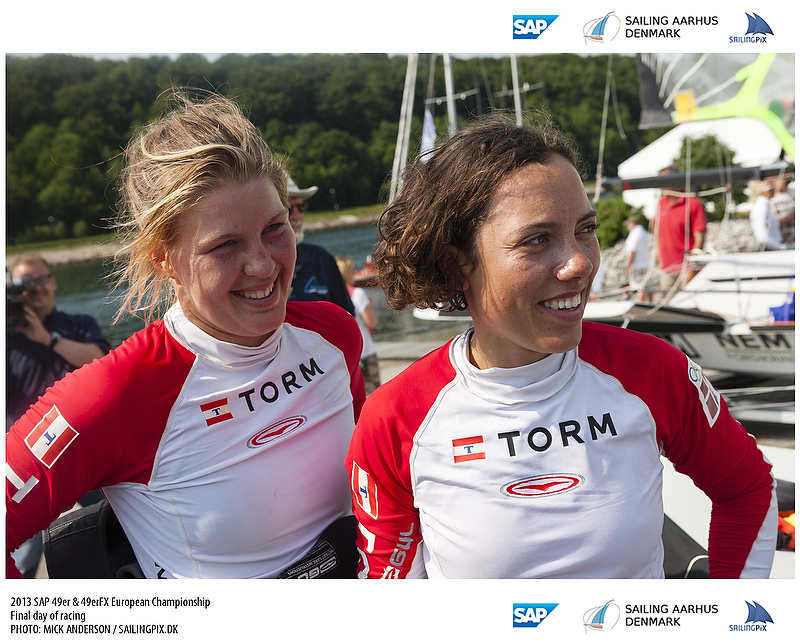 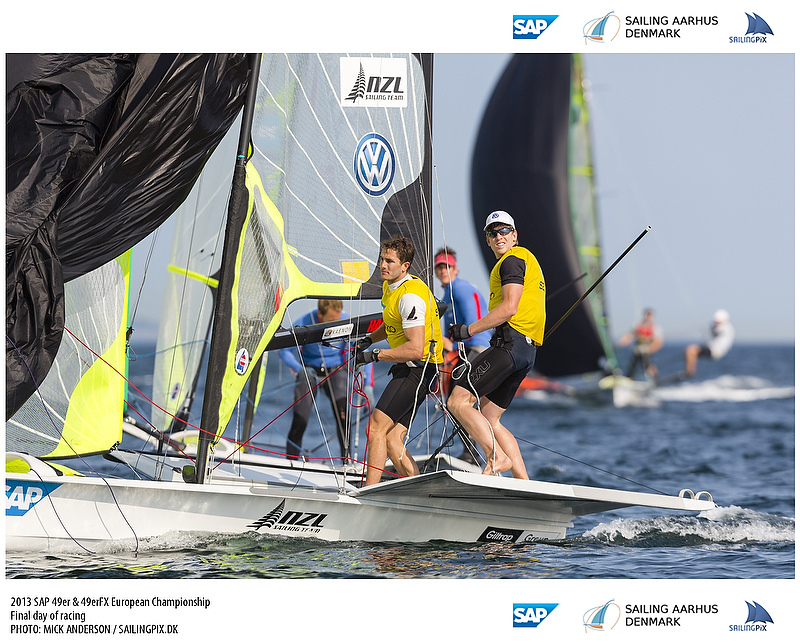 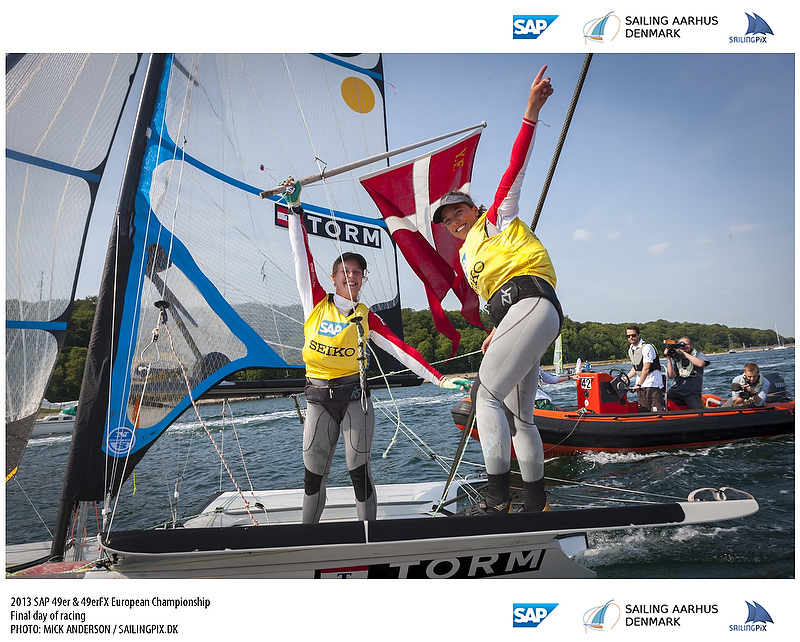 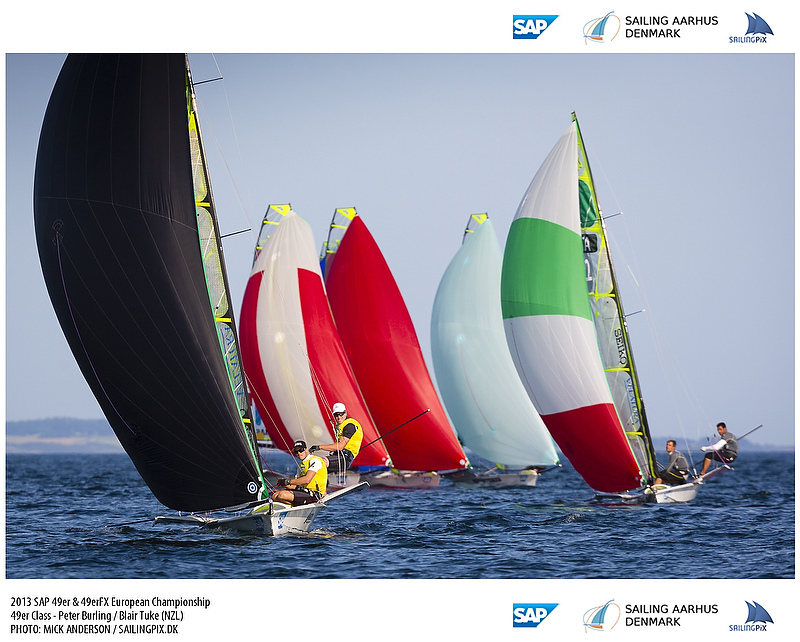 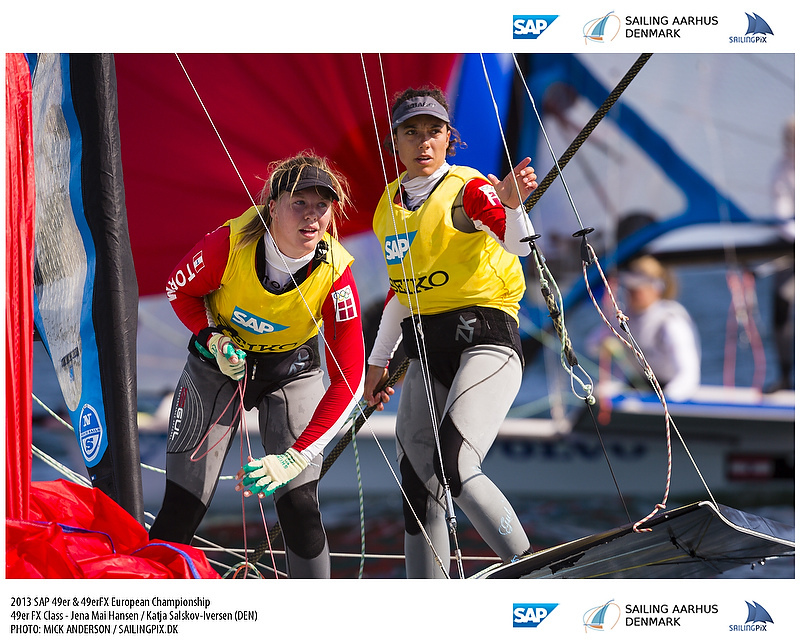 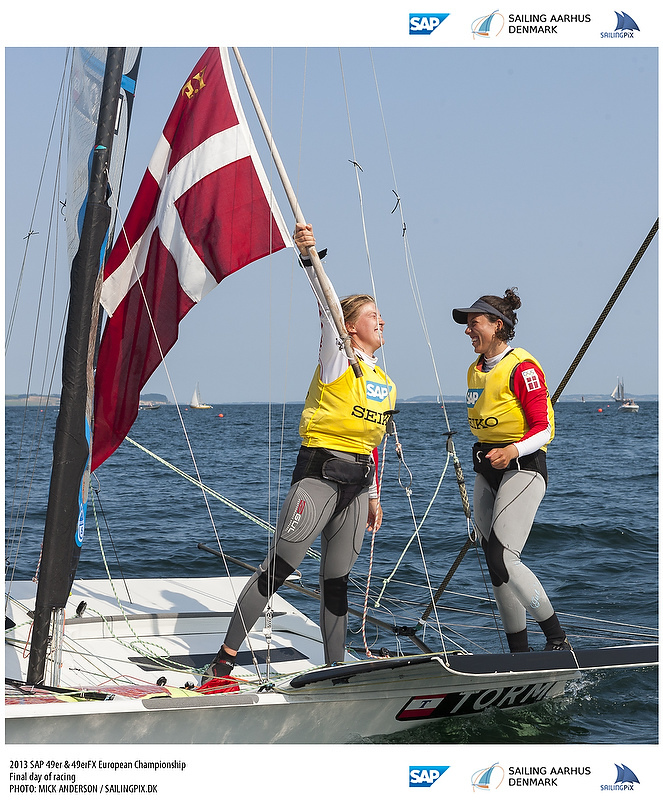 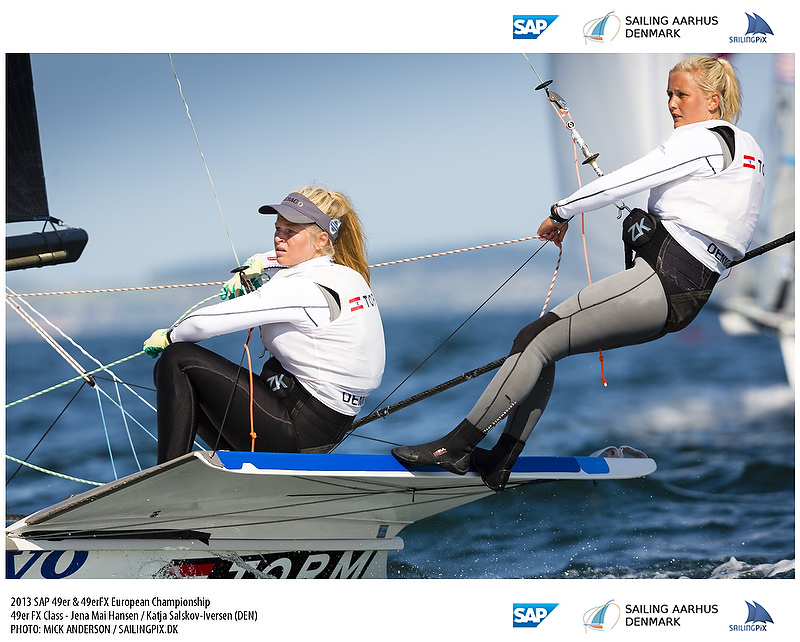 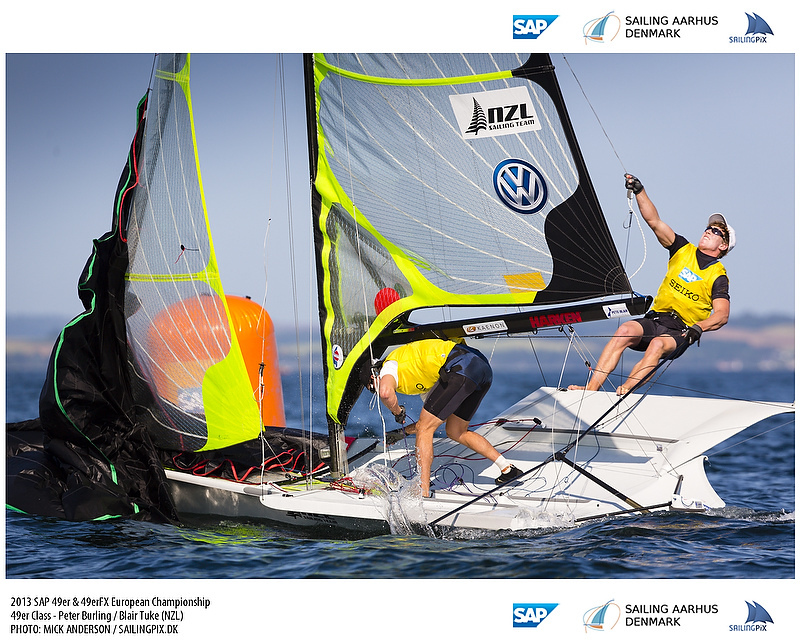 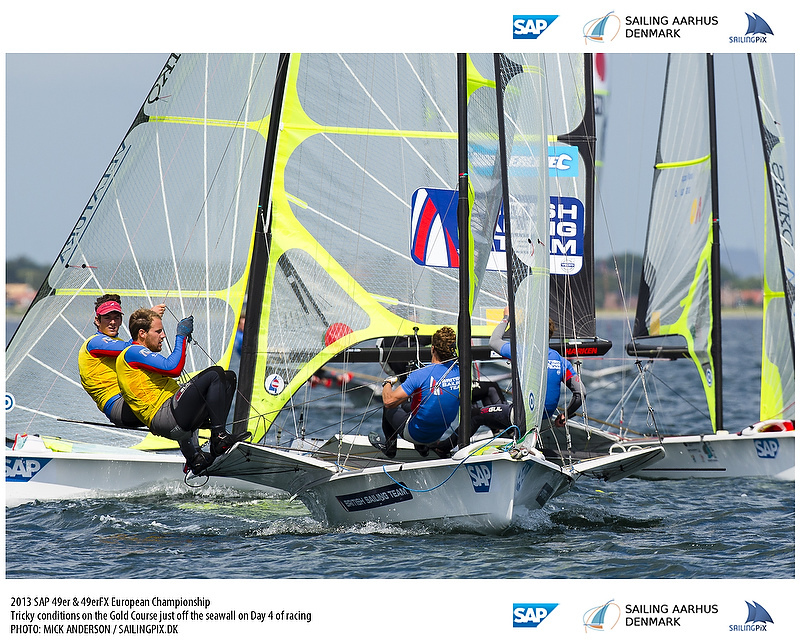 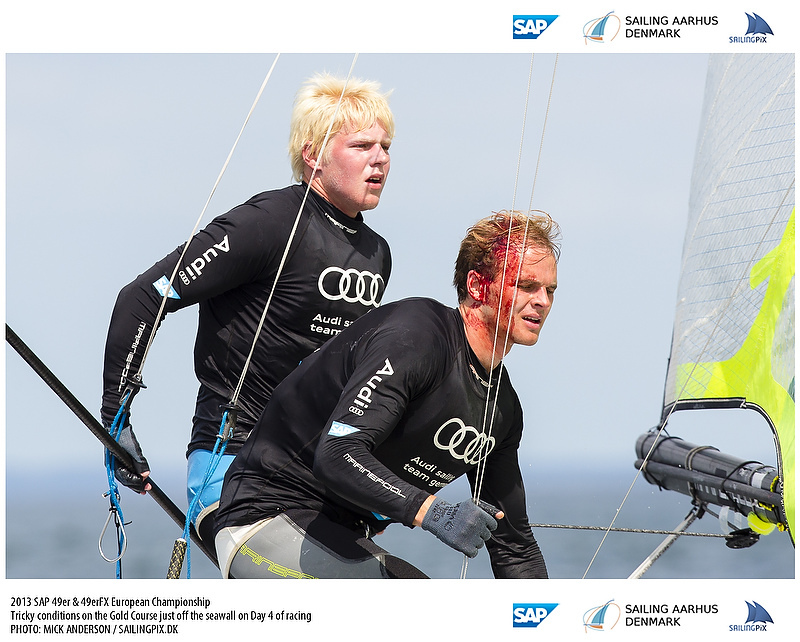 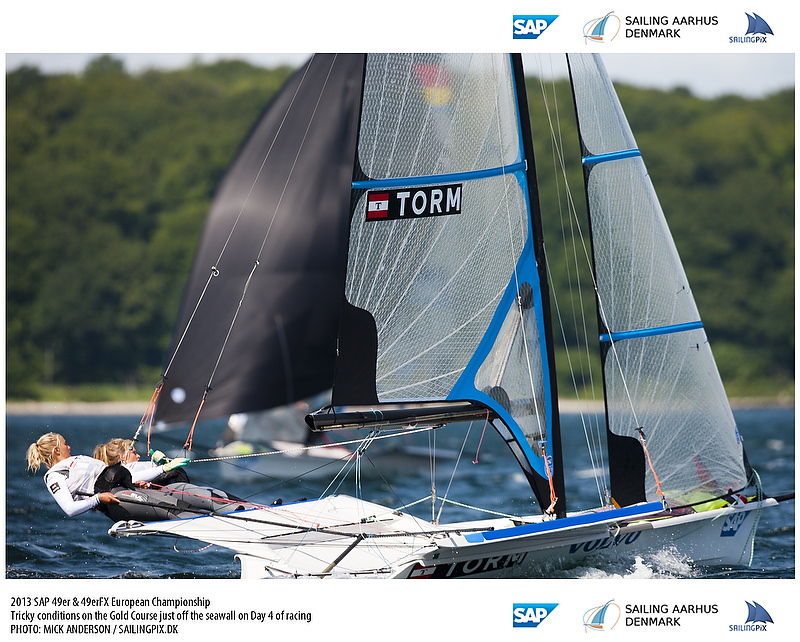 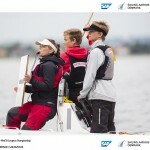 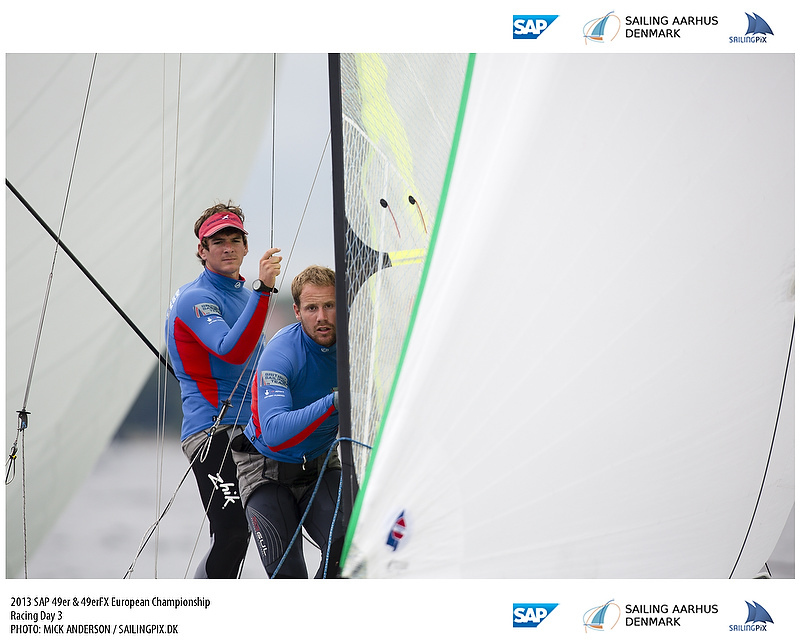 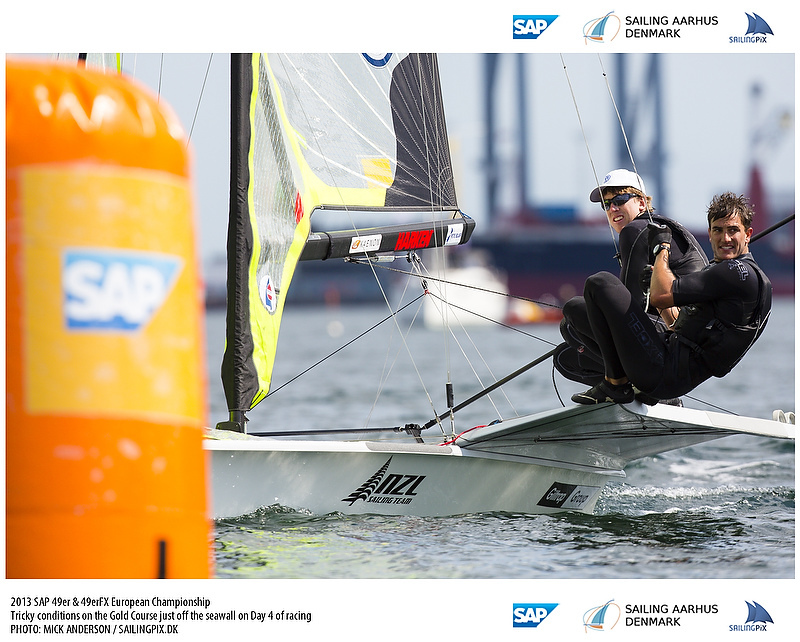 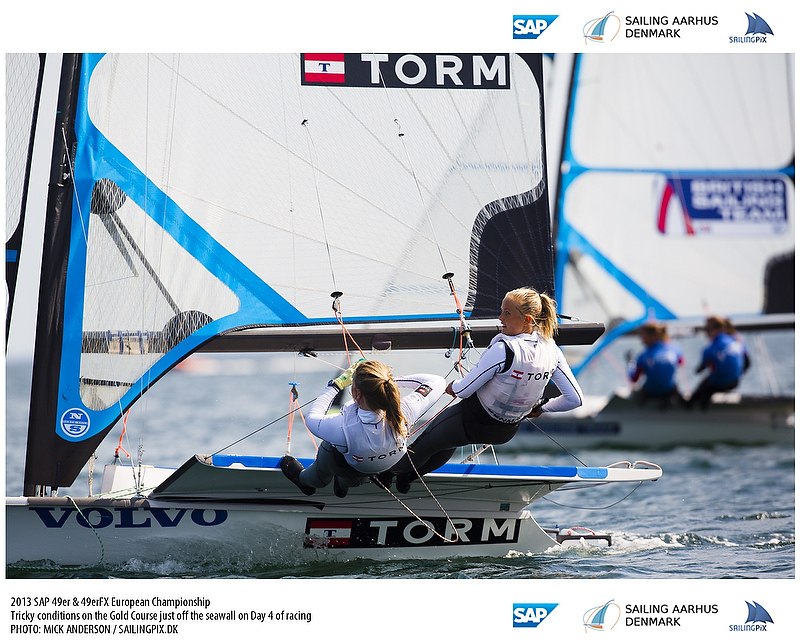 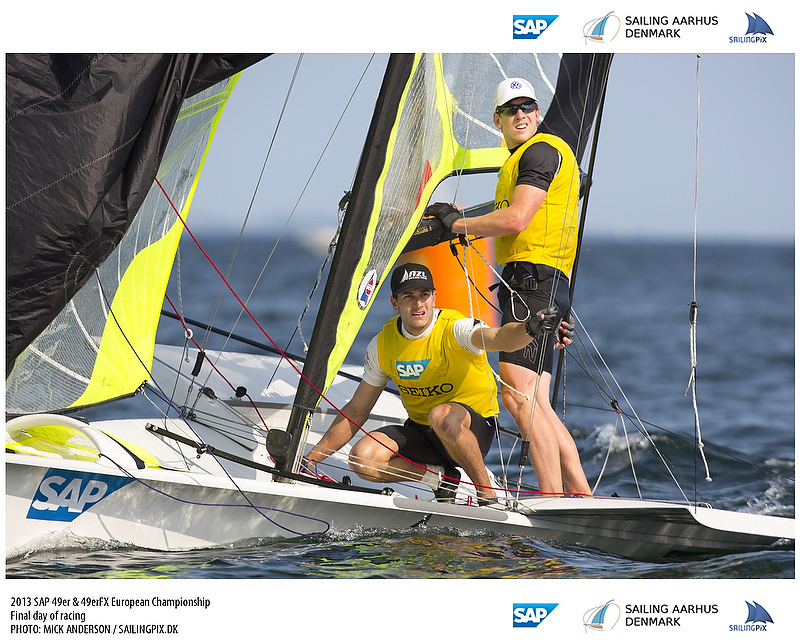 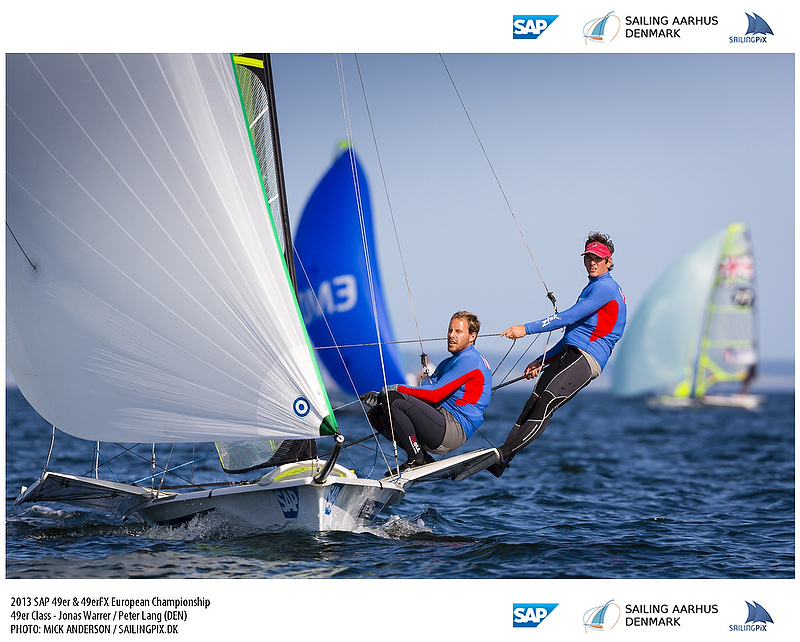 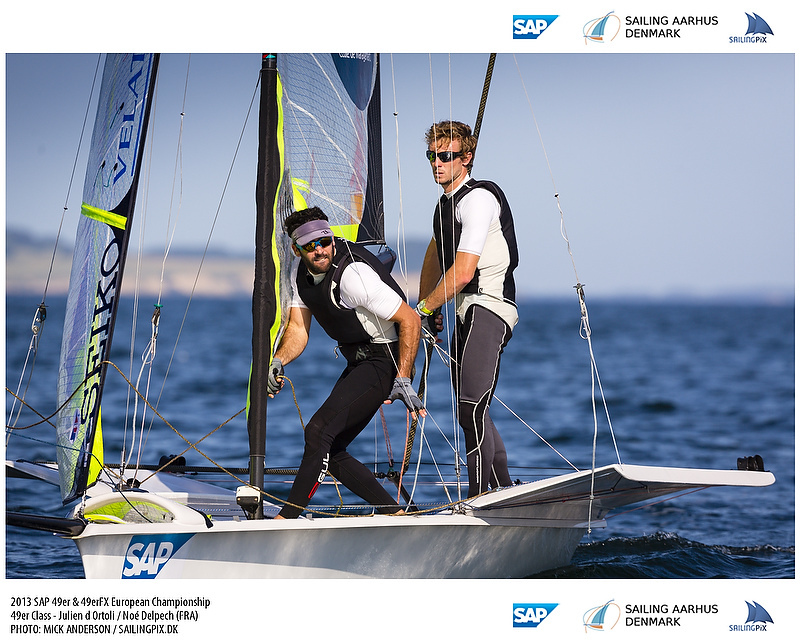 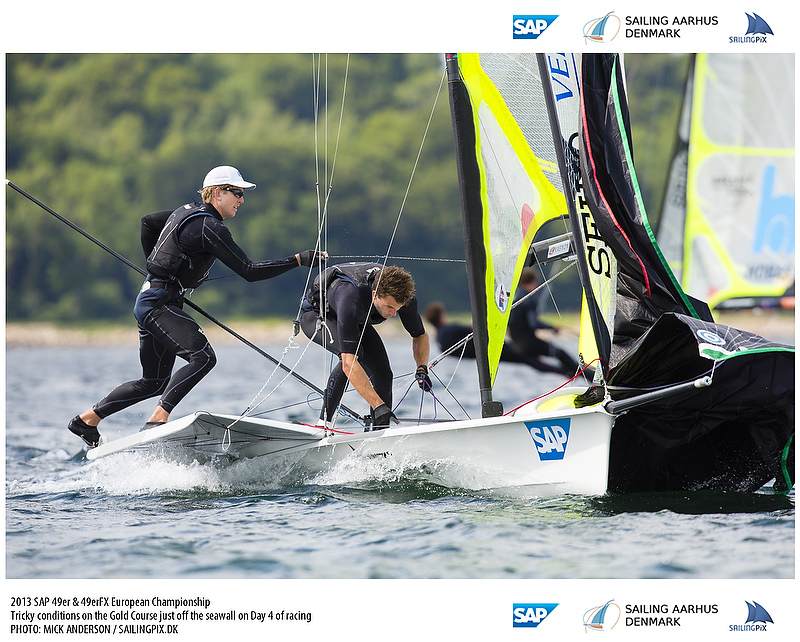 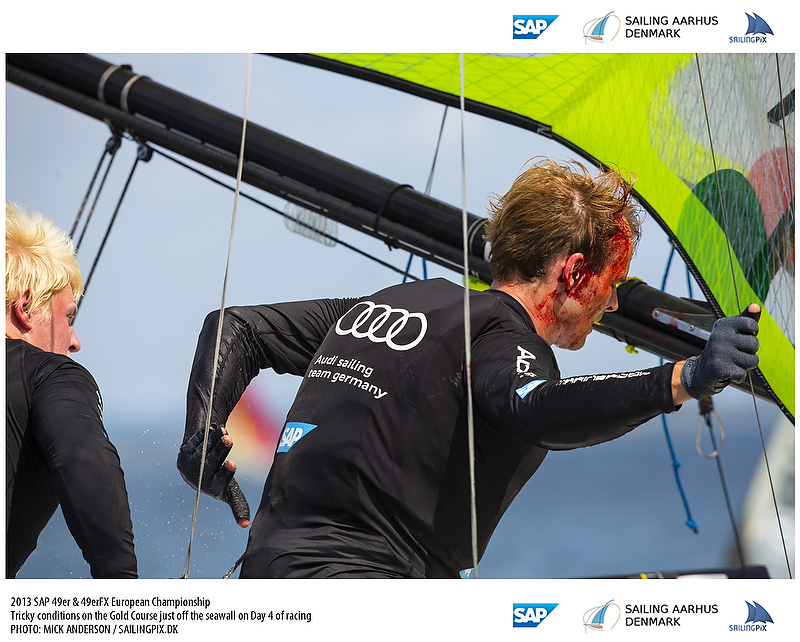 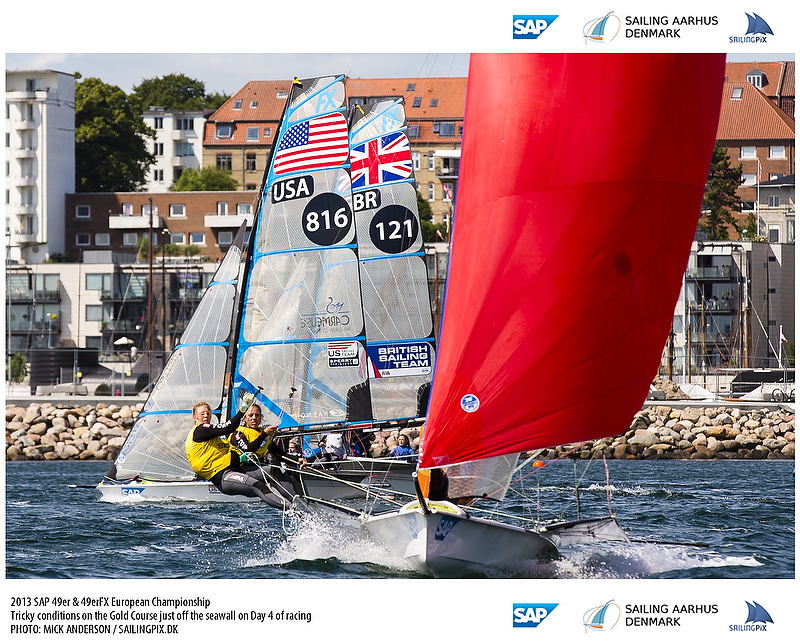 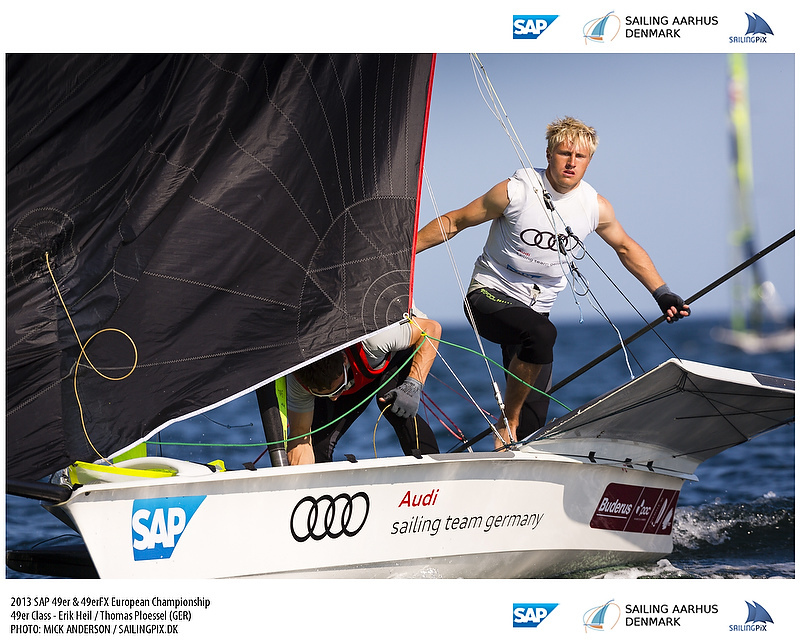 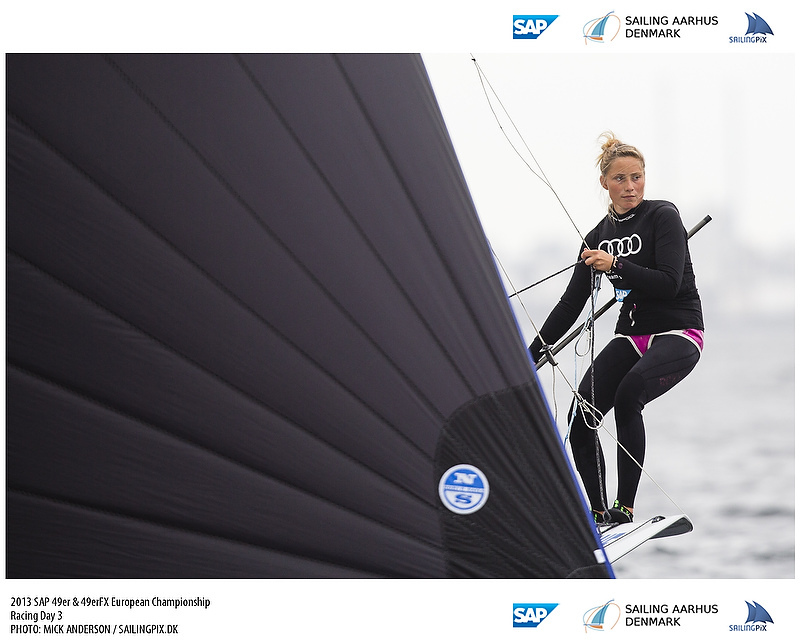 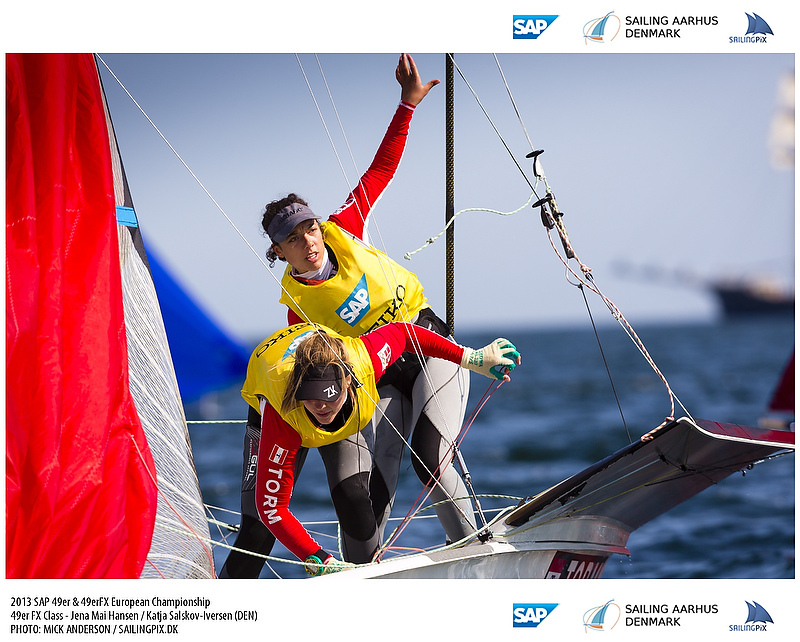 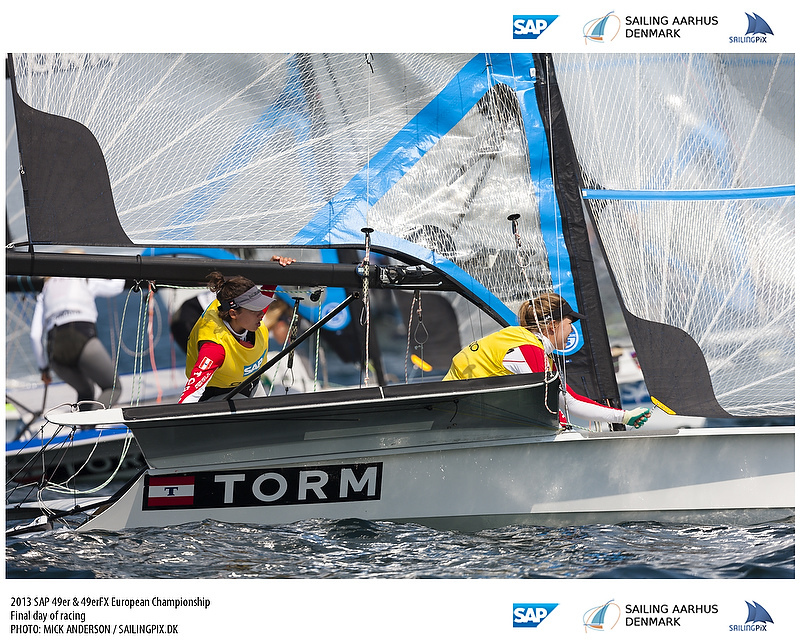 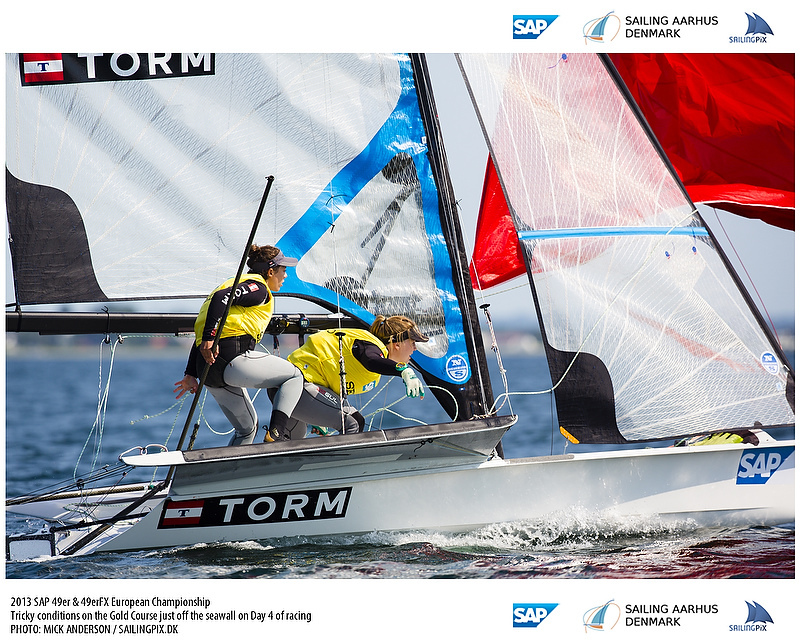 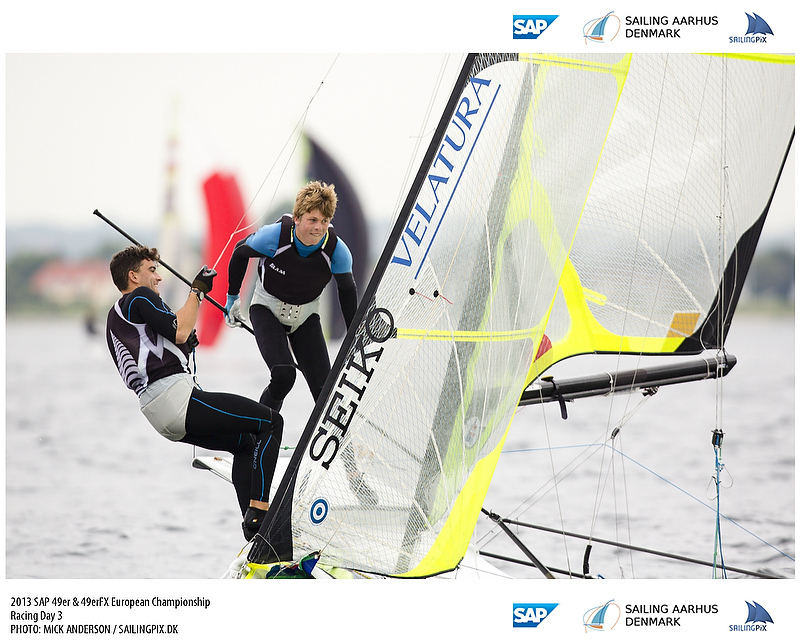 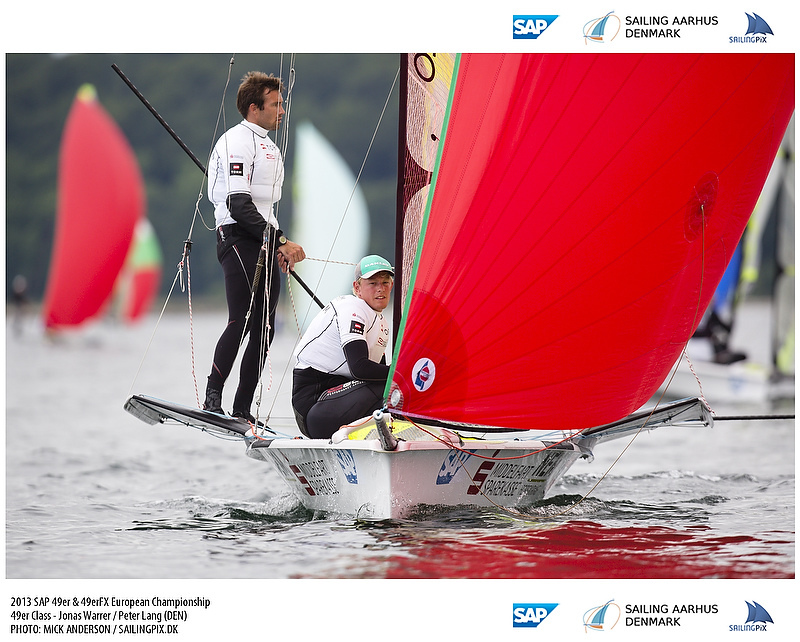 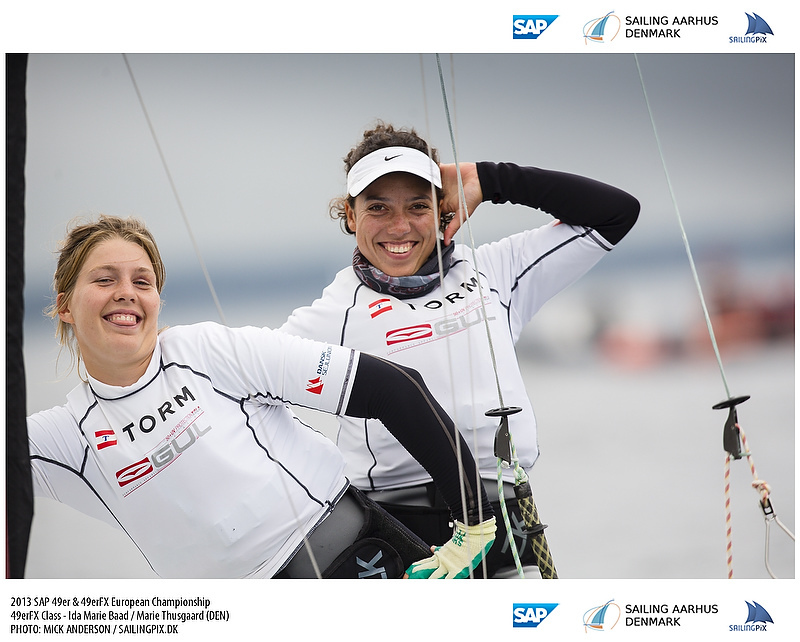 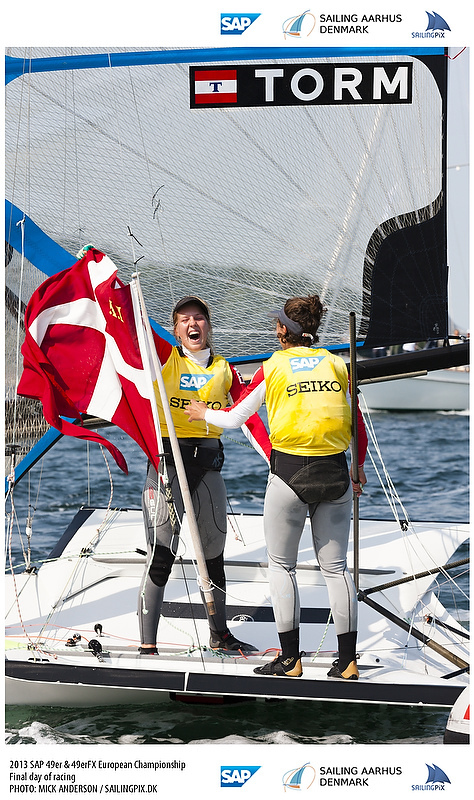 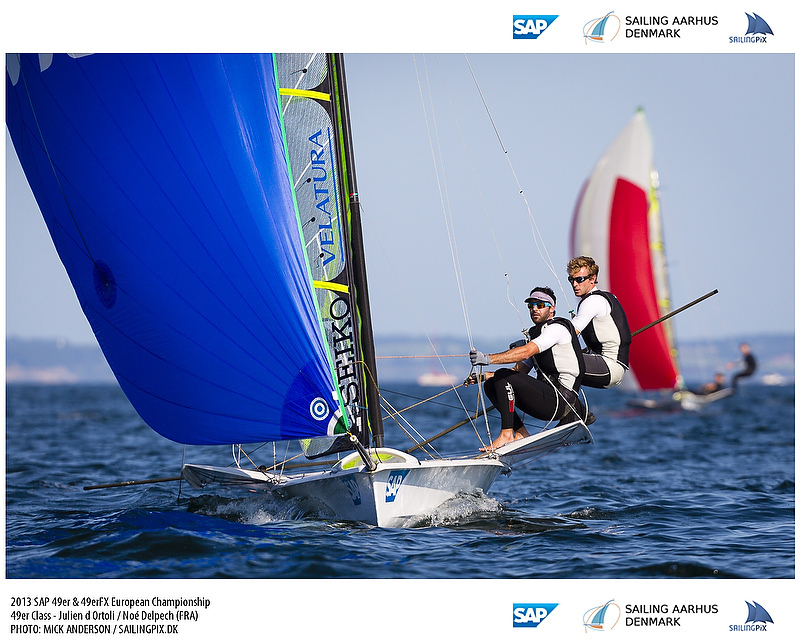 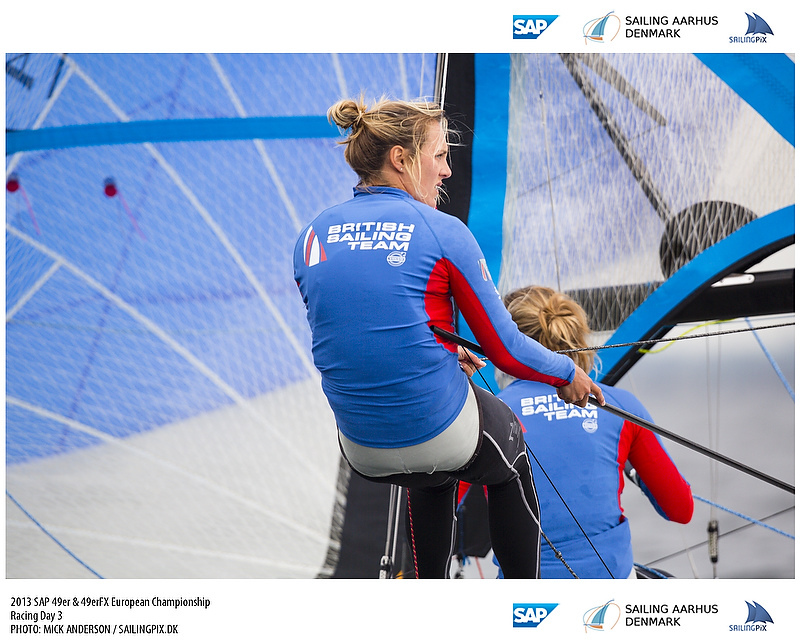 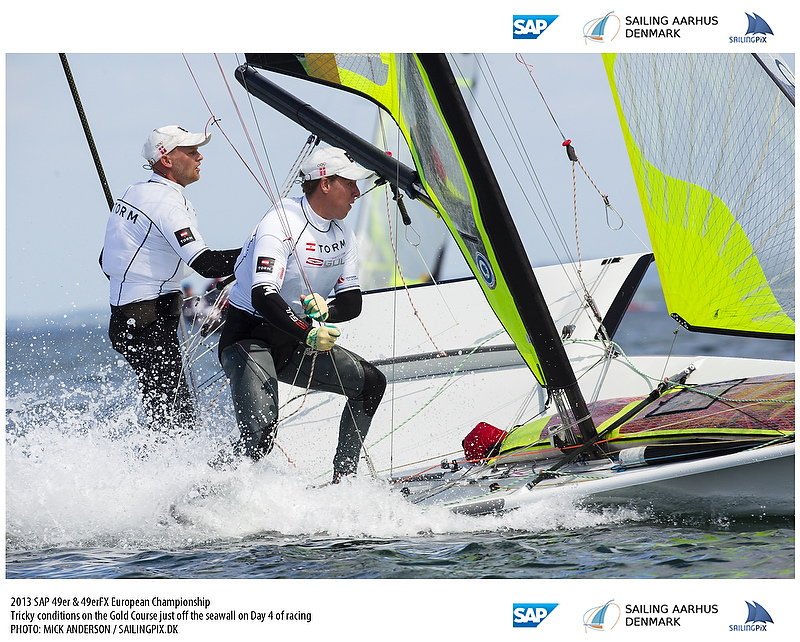 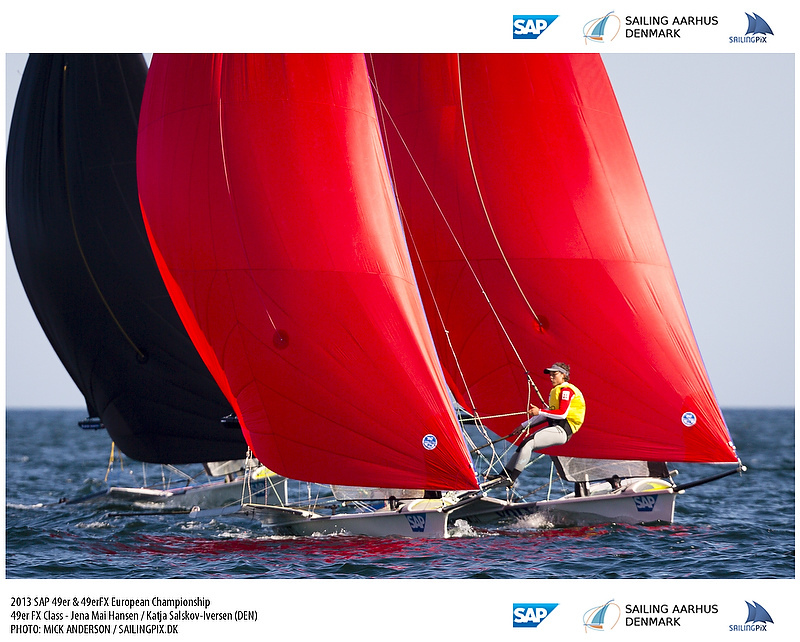 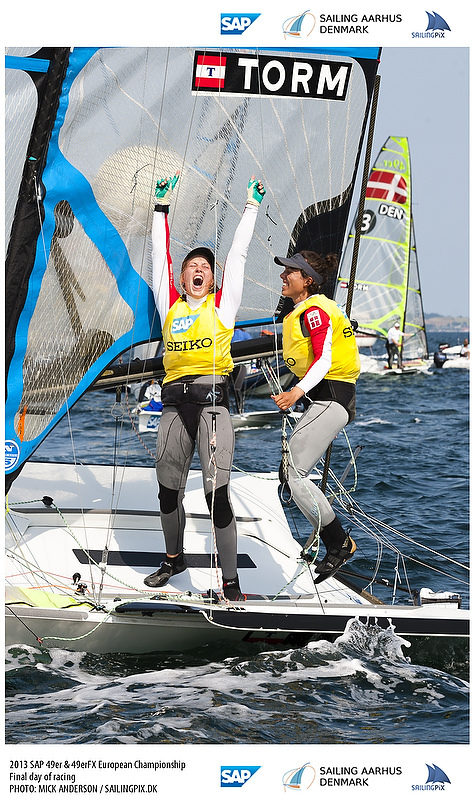 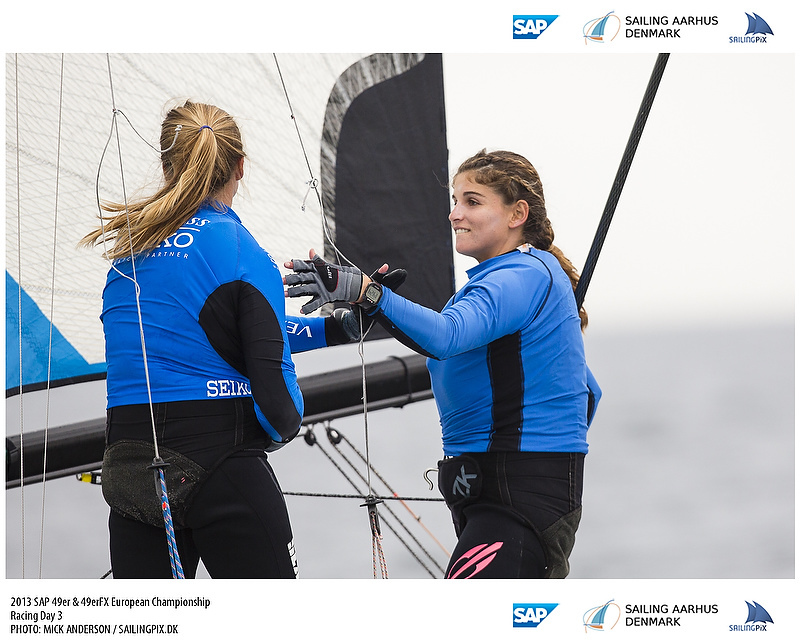 Finish team Lauri Lehtinen and Kalle Bask managed two 3rds in the last two races of the day and combined with the redress they were given in day ones 1st race they managed to get back into Gold fleet after a bad start to the day. 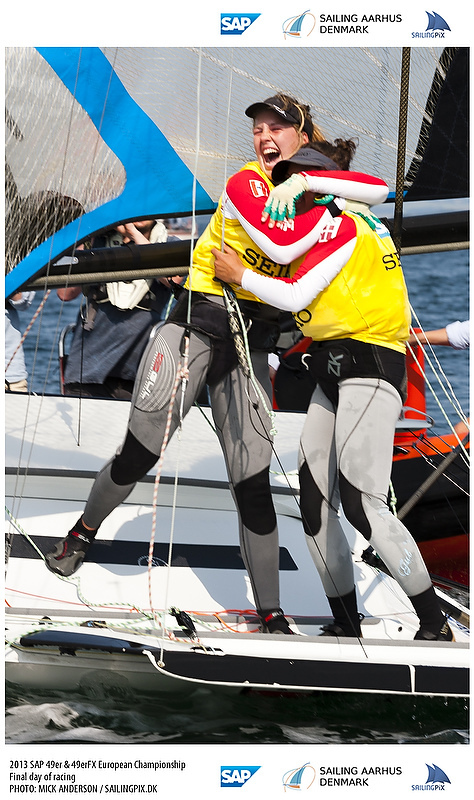 On the other end of the scale, it was heartbreak for some of the top teams. 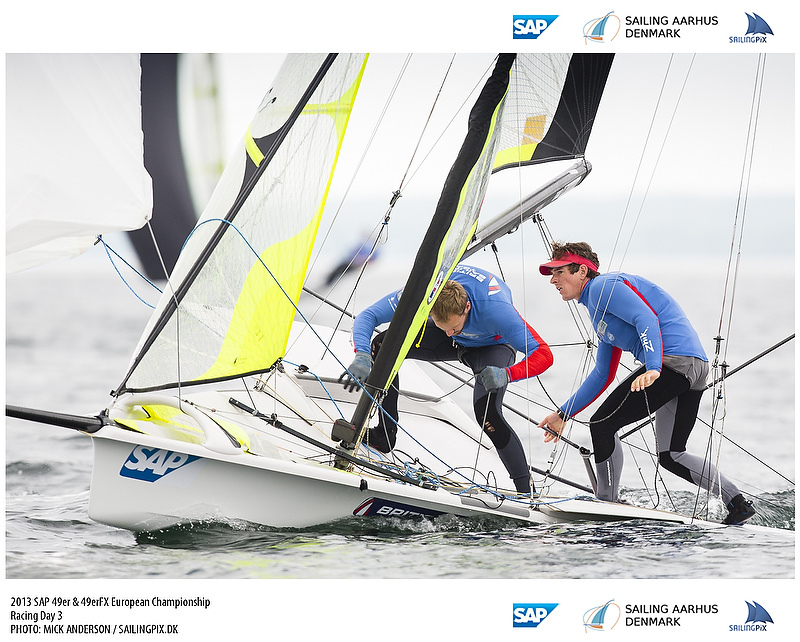 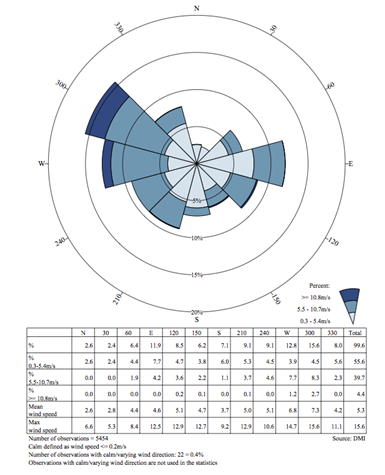 Den 11 – Jonathan Bay and Chris Thorsnell, POL 52 – Tomasz and Jaceck, GBR 19 – Jon Pink & Simon Wheeler, ESP-32 Carlos & Anton Paz, all missed gold by a few points. 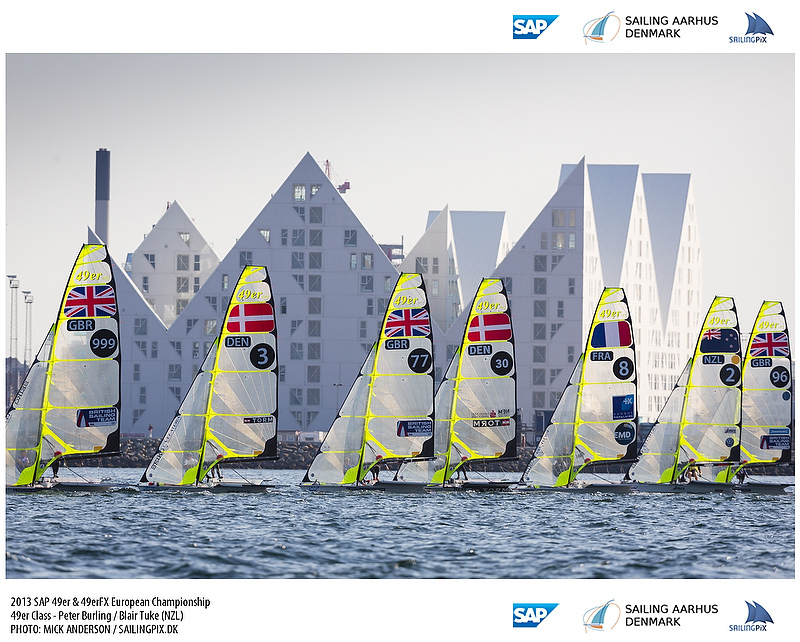 They will all be working hard tomorrow to move up to the top of Silver fleet by days end and earn their way back to gold fleet with our second chance option. 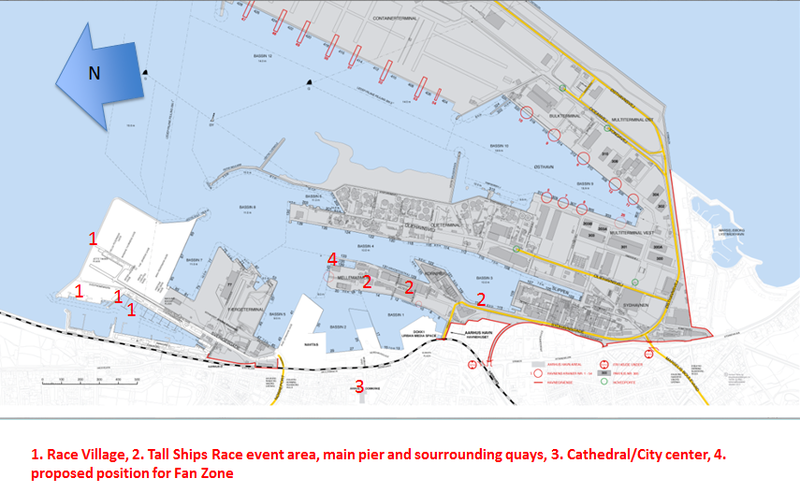 The team who is highest placed in Silver fleet will get promoted to Gold fleet at the end of day 3, and likewise 1 team will advance from Bronze to Silver. 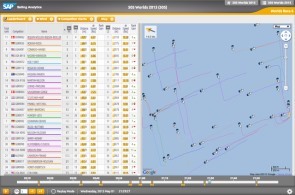 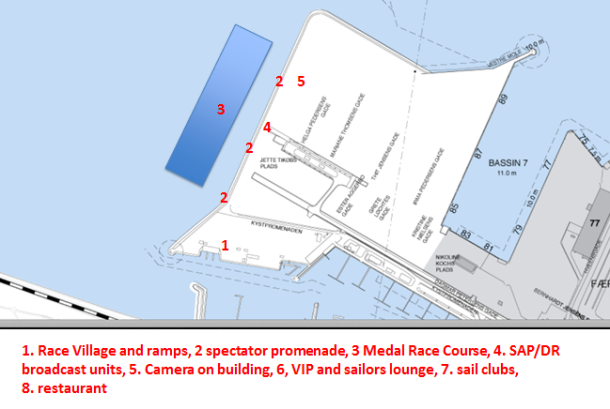 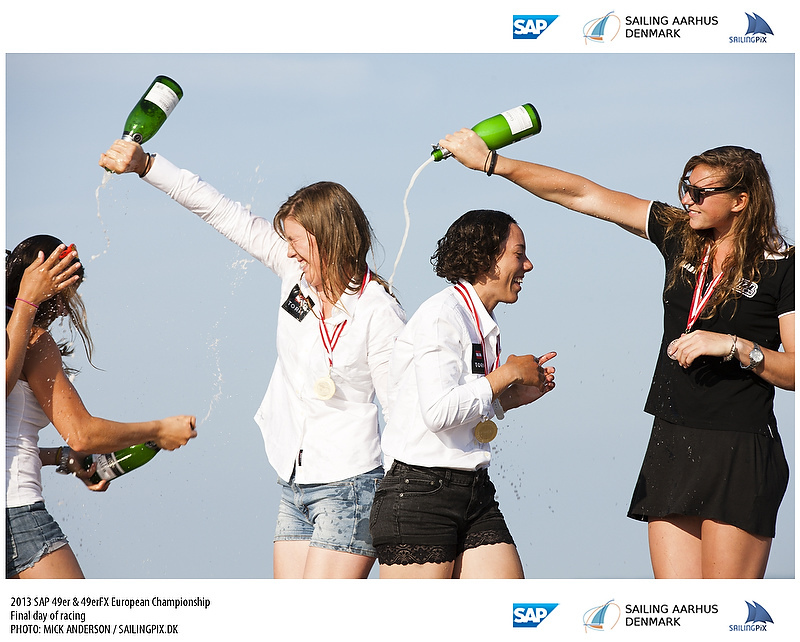 Stay tuned for Gold fleet racing tomorrow and live tracking on our championship course. Then on Friday through Sunday there will be the live broadcast, SAP and the STG crew are busy setting up so that everything is ready.